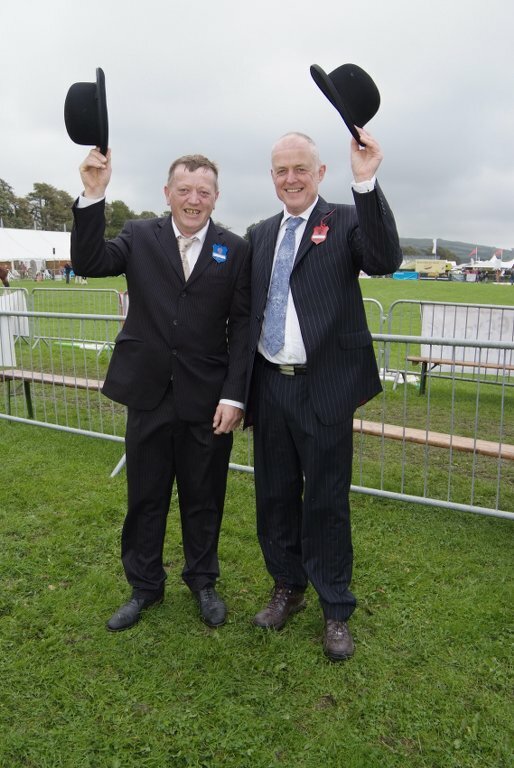 Tens of thousands of visitors, including one special Royal guest, made their way to a “landmark” Westmorland County Show on Thursday 13 September. 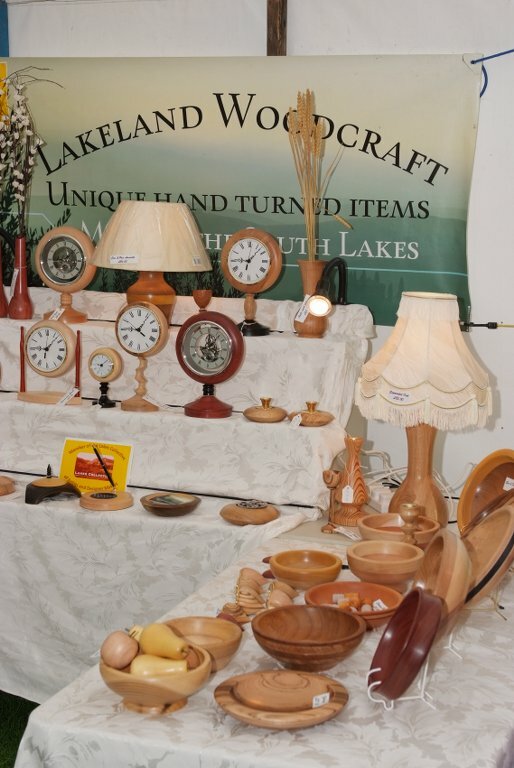 Around 34,900 showgoers attended the 219th Show at Crooklands, taking in all that Cumbria’s big day out had to offer. With every pen allocated in the extended area, a record 1,156 entries exhibited in the Sheep section, again generously sponsored by Rumenco. The Lowland Terminal Champion went to a home-bred Texel shearling gimmer from Peter Woof, Stainton, whilst Philip Elliott of Grizedale took the honours in the Lowland Non-Terminal section. 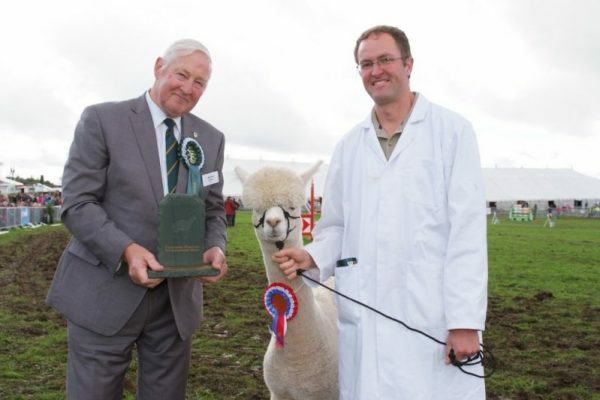 Supreme Upland Champion was awarded to a North Country Cheviot ram from Tom Bell of Keswick. The Cattle section, sponsored by Carrs Billington, also boasted near record entries. 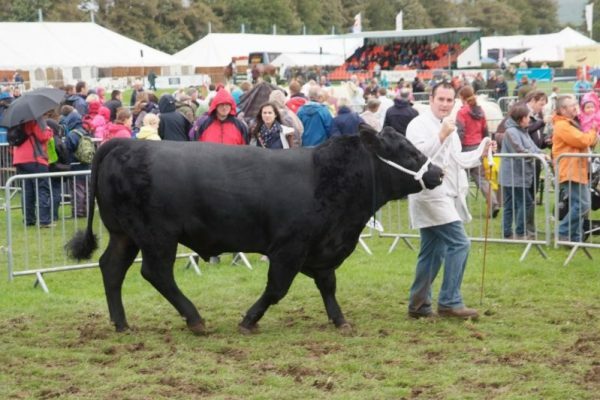 Hosting the national Aberdeen-Angus Show was a huge honour for Westmorland, with over 60 cattle forward competing for the overall honours. 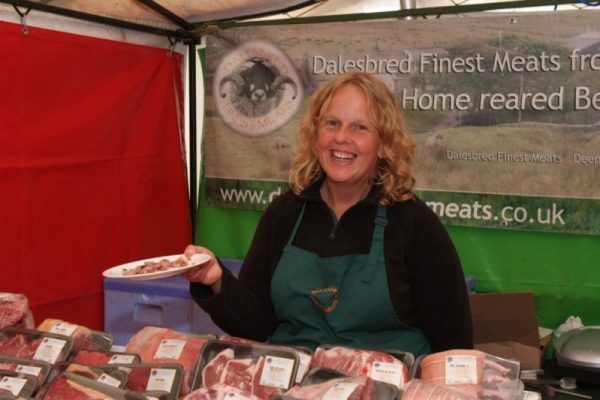 Travelling from the Isle of Skye, an elated Donald Rankin took the national title with Kilmaluag Eriskay, shown by Carol Rettie, going on to being judged reserve overall beef champion. There was time for one final championship title for Messrs Jenkinson of Penrith with Whinfellpark Park Glittered taking top honours in the beef section on her last outing before retirement being credited by judge Jeremy Price, Hereford, for her style in the ring. In the dairy rings, it was James Tomlinson’s Holstein fourth calver, Bilsrow Grafeeti Olympia judged as supreme champion by Wendy Young of York. 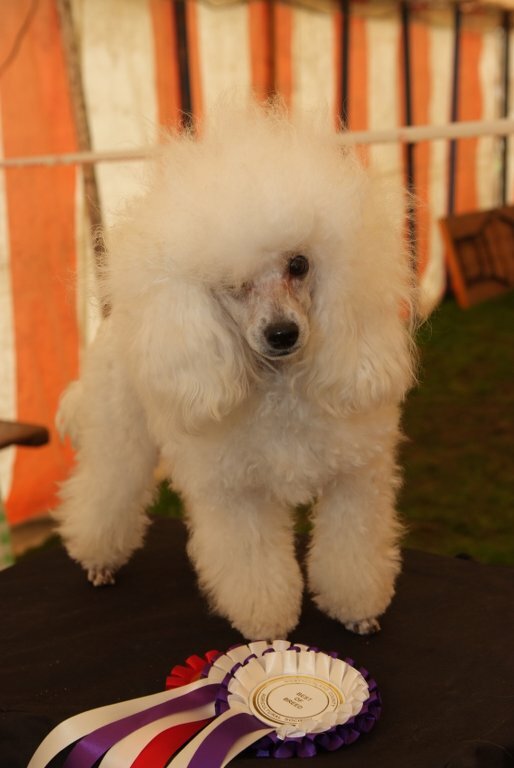 The Young Handler classes proved very popular with exhibitors and visitors alike, attracting a record 54 entries as well as keen competition. 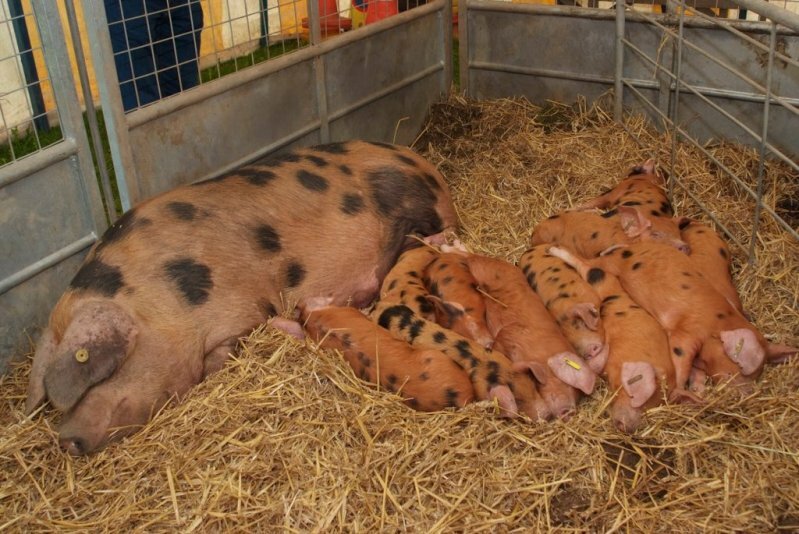 The Pig section, it was the Waltons of Cheshire who took the modern breeds rosette before clinching overall championship with a Duroc gilt. Holding their national Champion of Champions, there was an excellent turnout of Tamworth pigs, with Andrew Brown taking the overall championship. Relocating the Goat section to be alongside the Pigs and Alpacas proved very popular providing more ring space for visitors to watch. 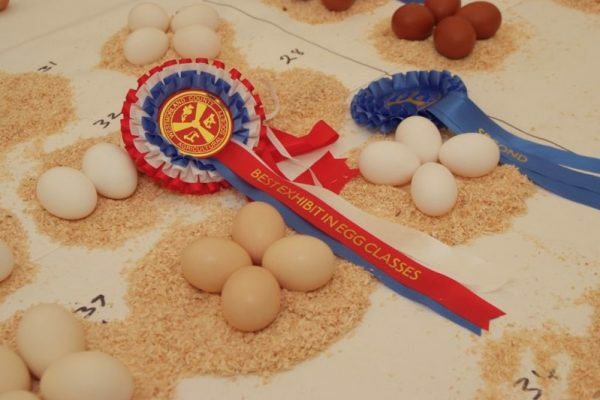 The Poultry section also enjoyed record entries with the marquee packed with hens, bantams, game birds, waterfowl and eggs in what Jim Benson, Chief Steward described as “the best show of birds ever at the Show”. Joe Heeley and his father Paul were delighted with winning the overall championship with their Light Sussex Cockerel. 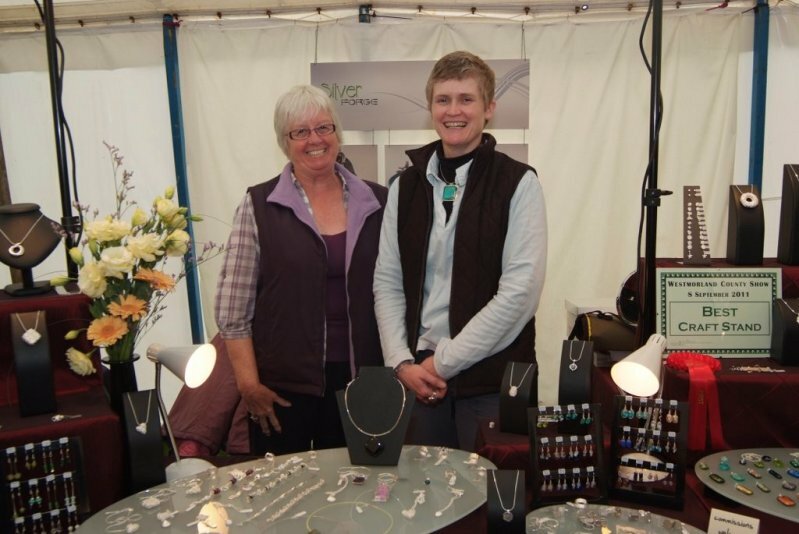 Enjoying their second year “across the road” the Equine Village was busy throughout the day, also boasting record entries for the Light Horse section with the Supreme Champion awarded to Danii Thexton of Kendal. Stuart Roberts, NFU Vice President, was a very welcome guest, and was especially impressed by the quality and numbers of livestock exhibited. Newly-appointed DEFRA Parliamentary Under Secretary of State, David Rutley MP, was particularly complimentary about the Society’s commitment to education and was bowled over by the quality of diversity of food producers in the Food Hall where he presented the stand prizes. The rain shower failed to deter spectators packed around the wrestling ring, where Graham Brocklebank was hailed world champion in the all-weights category. 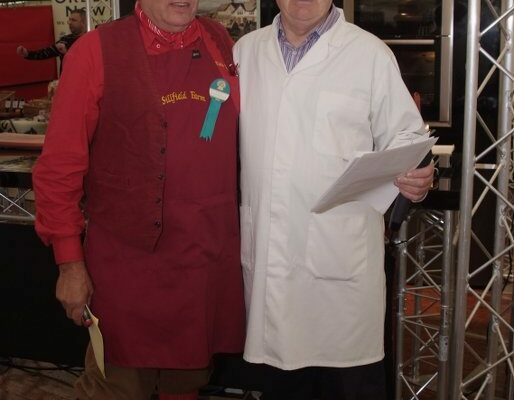 Food Theatre audiences were wowed with appearances from the renowned Brian Turner CBE, alongside Cumbria’s own Samling Hotel, Gary McClure and master fishmonger Sharon Heron. Simon Jarman also provided an insight into the life of an army chef, serving World War I military fare. Alongside the magnificent mix of school displays there was a real generational mix in the Learning for Life marquee with Cumberland and Westmorland Antiquarian and Archaelogical Society members encouraging children to use quills. 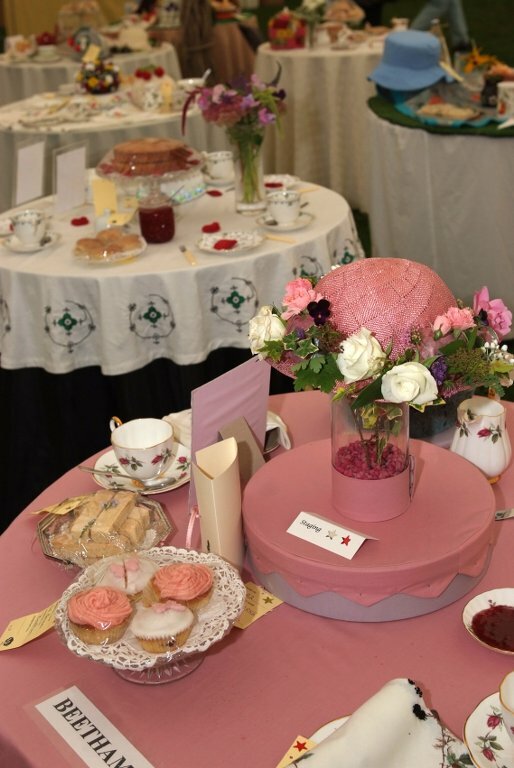 Many more traditional crafts and skills were on display in the WI marquee where members were celebrating Inspirational Women. Both the Society’s chosen charities, RABI and North West Blood Bikes had a strong presence, with the latter also organising the Food Creche facility in the Food Hall. 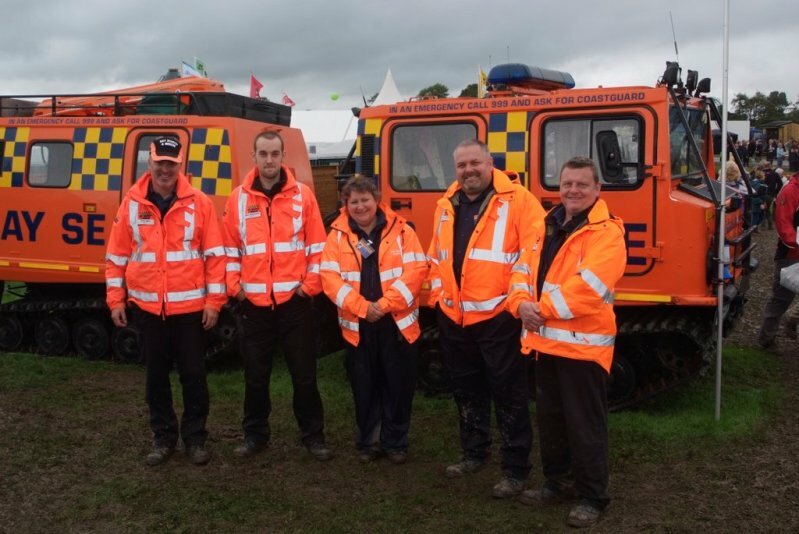 All in all, 2018 was a truly outstanding County Show, only made possible thanks to the visitors, exhibitors, volunteers, stewards and judges who supported the 219th Westmorland County Show – a huge thank you to you all. Beautiful sunshine and blue skies greeted showgoers for the 218th Westmorland County Show on Thursday 14 September. Following a challenging build, around 30,900 visitors streamed through the gates to take in the sights and sounds of what proved to be a fantastic day for all involved. Every year is special but 2017 was certainly a momentous occasion, when we were honoured to welcome HRH The Prince of Wales on his first visit to the Show. His Royal Highness was given a very warm Westmerian welcome by President, John Geldard, and Chairman, Stephen Procter, who along with Chief Executive, Christine Knipe, accompanied him on his tour of the Showground. The Prince’s visit included a brief tour of the Food Hall, where exhibitors presented a local produce hamper before visiting some trade stands. The Royal party then toured the sheep lines, where His Royal Highness presented the Upland Interbreed Championship, met sheep exhibitors and NSA Young Ambassadors in addition to watching demonstrations from RBST Young Shepherds. 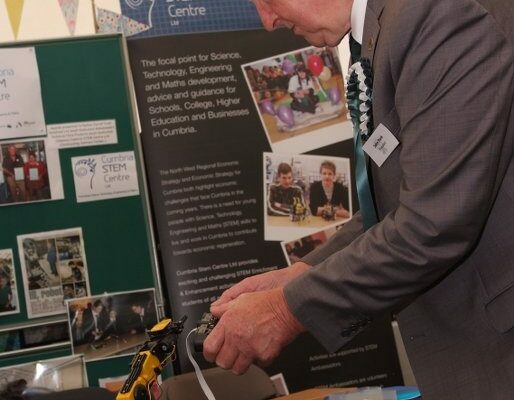 Following the Lakeland Reception, the Prince visited the cattle section, meeting many exhibitors, before visiting the Cumberland and Westmorland Wrestling where the Under 15’s were keenly competing. 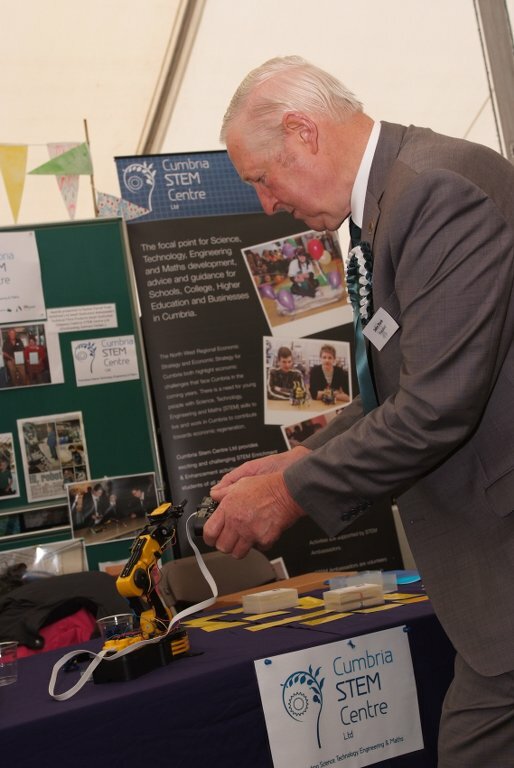 His Royal Highness then managed a visit to the Rural Crafts marquee, where he was particularly pleased to see many younger exhibitors demonstrating traditional skills. 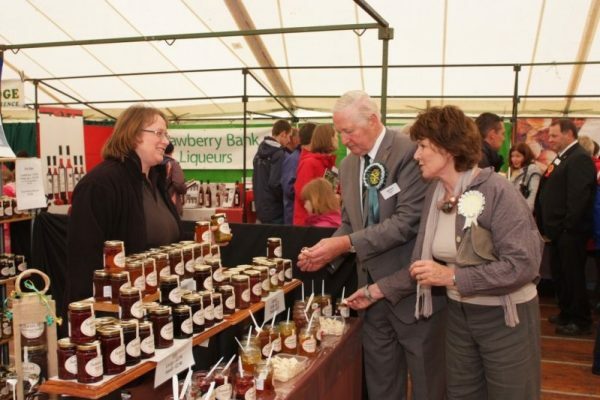 Throughout the visit, the Prince took time to talk to visitors, stewards, exhibitors and producers. All in all, a very busy, and special day for all! Welcoming farmers from across the country, the quality of the livestock was superb, including another record year for sheep entries, the fourth successive year. 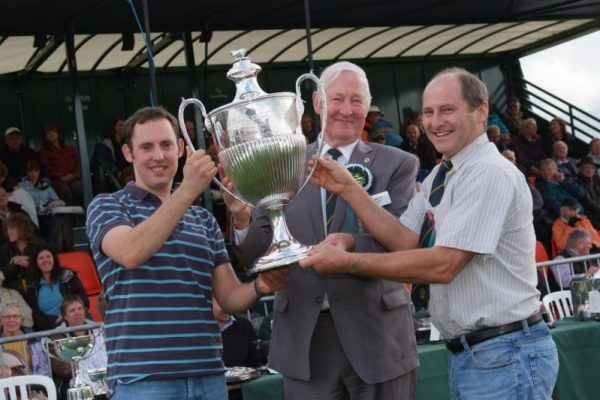 Overall Upland Champion was presented by The Prince of Wales to Swarthmoor farmer Clive Richardson for his Jacob Ram. Lowland terminal title went to John and Adam Gargett’s Blue Texel, and the Lowland non terminal was awarded to Richard Batty of Selside for his Mule gimmer, with both trophies presented by sponsors Rumenco. 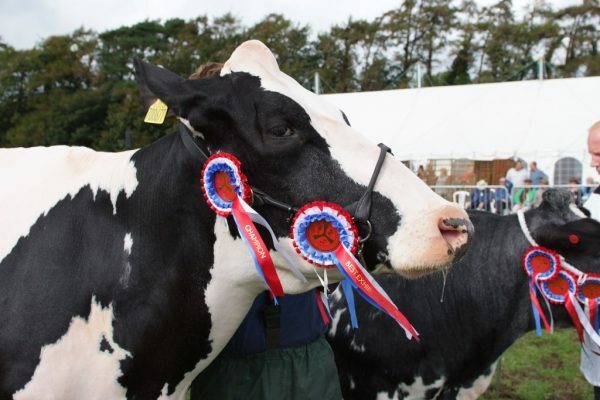 Although cattle entries were slightly down, interbreed judge Michael Eavis commented that the standard was extremely high. Sponsored by Carrs Billington, Holsteins come out on top in the dairy lines, with Interbreed Dairy Champion awarded to Tom Stable of Ulverston with home-bred fourth calver Bolton Manor Damion Sadie 3, whilst Ben Richardson’s Limousin Mystyle Maitoi took poll position in the Interbreed Beef. Reserve Dairy Supreme and Red and White Champion went to P.D and B.S Lawrence with second calver Newera Adventure Deal Red. 2017 saw the introduction of a brand new breed team trophy, for the best team of four cattle which made for an impressive sight in the main ring. 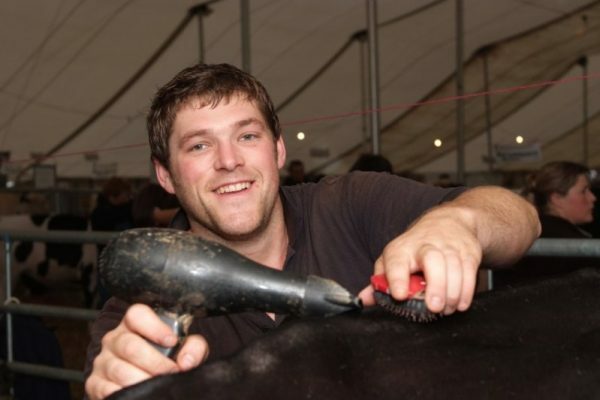 The competition was clinched by the Limousins, whilst the best pair of cattle was awarded to David Loftus’ British Simmentals. NFU President Meurig Raymond greatly enjoyed his visit, taking the opportunity to talk to many farmers. In the Pig rings, both the traditional title and overall champion were awarded to Brian Merry’s Middle White gilt Pinehurst Alma Rose II, who has had a fantastic year, winning Breed Champion at Royal Bath and West Show, and Reserve Champion of Champions at the Great Yorkshire. Relocating the new “Equine Village” to the “horse fields” across from Gate B was hailed a resounding success, enabling larger rings and improved box parking. Entries across the Light Horse section were very healthy, with the supreme title taken by Mrs Abba’s Show Hunter Pony Fleetsmore Fire Cracker, ridden by Olivia Taylor. 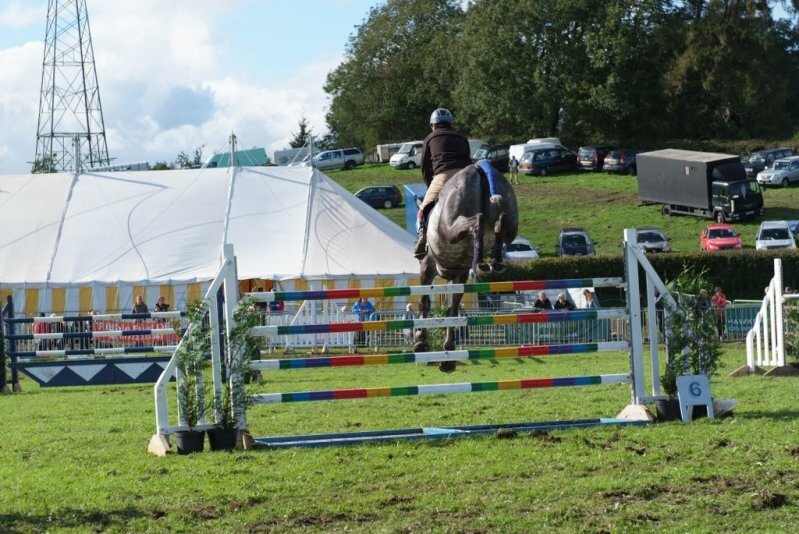 Although the show jumping was called off due to ground conditions, competitions went on well into the afternoon, whilst the sun shone down on the Showground. In the Cumberland and Westmorland Wrestling ring, Graham Brocklebank won both the 13 and 14 stone categories, with Jack Brown presented with the James Cropper trophy for Most Meritous Performance, and Thomas Davidson scooping three trophies for the juniors. The Pig and Alpaca sections enjoyed their new locations, and the enlarged Forestry Arena included chainsaw carving and horse logging demonstrations alongside the very popular Cumbrian Axemen. Food Theatre audiences were wowed with appearances from Phil Vickery, alongside Cumbria’s own Aidan Monks, Steven Doherty and Arthur Bridgeman Quin winner of the 2017 William Heptinstall Award. 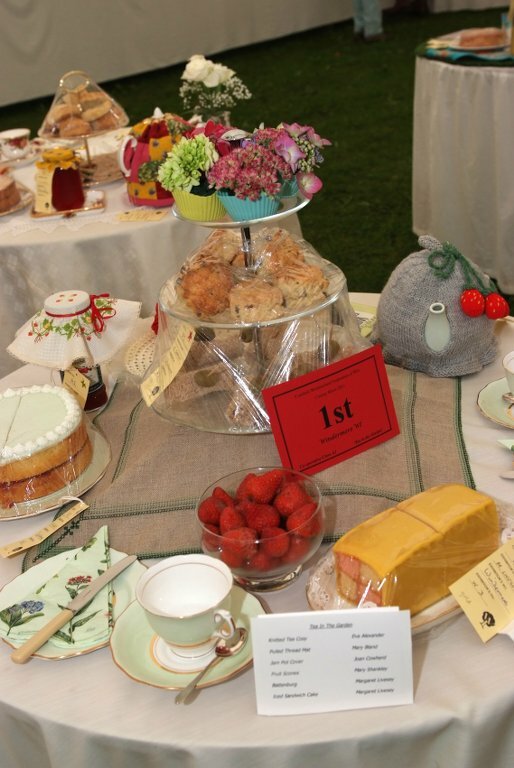 The extent and quality of exhibits and displays within the marquees improves each and every year, with the WI recording record entries. 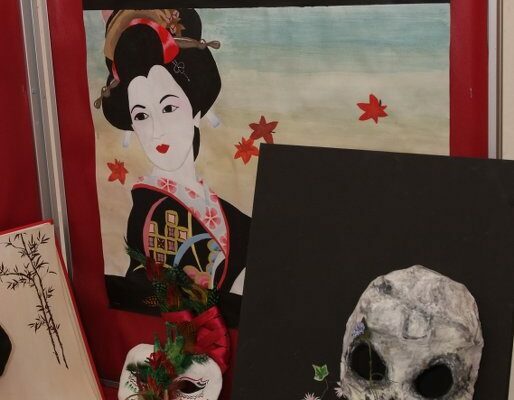 Following 17 years at the helm, David and Liz Lawson presented the “best display yet” in the Learning for Life marquee which was brimming with schools and interactive displays. 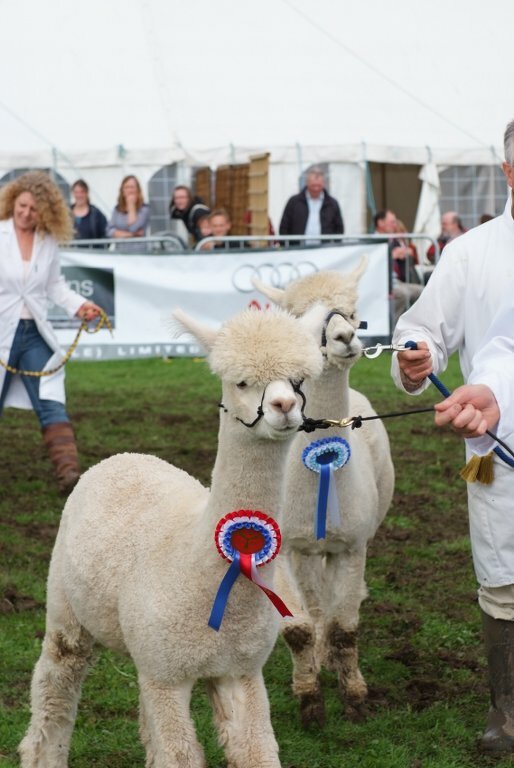 A huge thank you to all the visitors, exhibitors, volunteers, stewards and judges who supported the 218th Westmorland County Show – we couldn’t do it without you. 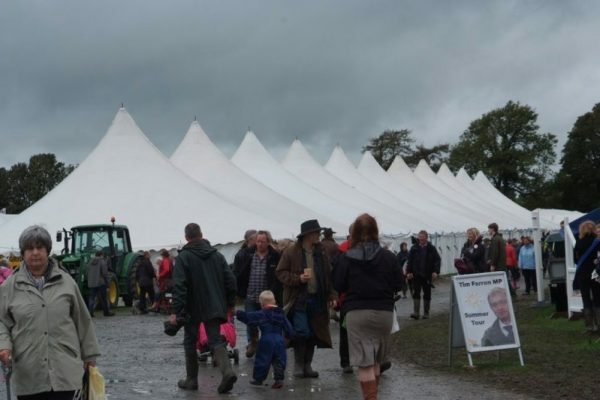 Rain failed to dampen the spirits of show-goers for the 217th Westmorland County Show on Thursday 8 September, when an estimated 26,500 visitors streamed through the gates to take in the sights and sounds of what proved to be another fantastic day. 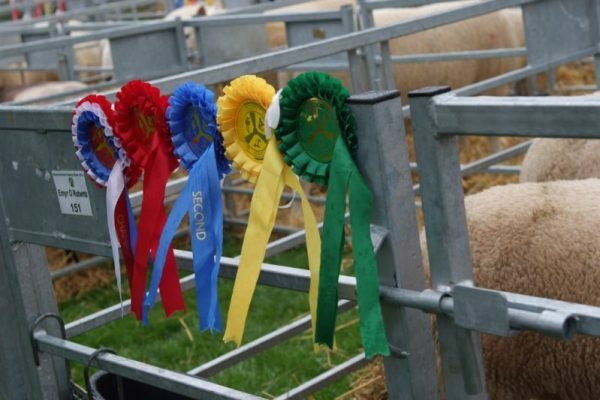 With every sheep pen allocated and taking full advantage of the new metal hurdles, a record 1,038 entries exhibited in the Sheep section, again sponsored by Rumenco. A Herdwick, owned by Hannah Dickinson of Kentmere, emerged as the overall upland champion, the first time in 25 years that the breed has triumphed in the overall section. 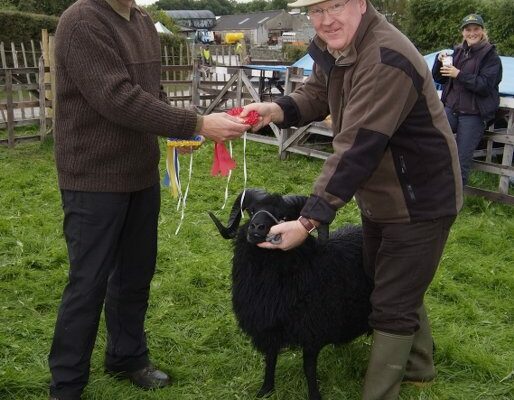 The lowland terminal title went to Peter Woof of Stainton with a home-bred Texel gimmer, whilst John Thorburn of Annan took the non-terminal honours with his Zwartbles ram. An elated Mr Thorburn then went on to be presented with the Champion of the Main Ring trophy. Continuing the policy of only permitting cattle pre-movement tested for TB, the cattle section, sponsored by Carrs Billington, saw an increase in entries, with exceptional quality throughout. Leading the large dairy lines was Bob Lawrence from Grange-over-Sands with a 6-year old Holstein second-calver Lordsplain Ross Ruby. 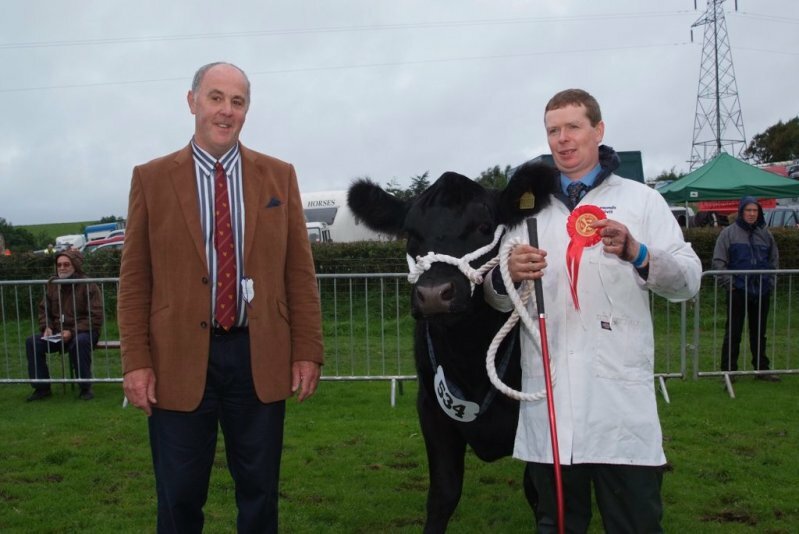 Messrs Jenkinson of Clifton Moor won the interbreed supreme beef championship with Whinfellpark Glittered whilst a delighted David Cornthwaite was awarded the Woof Pitcher for the best pair of cattle with his home-bred Galloways. There was keen competition in the Young Handler classes in both sheep and cattle sections, both attracting increased entries. Jim Benson, Chief Poultry steward said it had been the best show of birds at Crooklands. 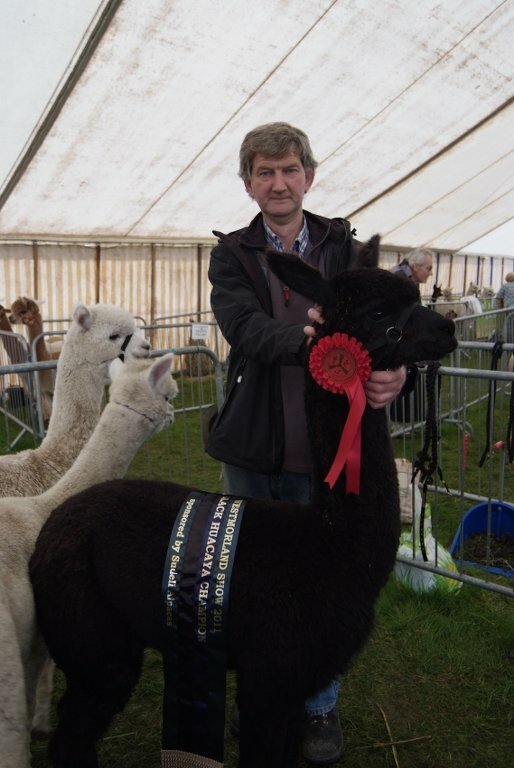 Entries in the Alpaca section again reached capacity, and whilst entries in the equine section were reduced slightly, there were still almost 700 entries across the classes, with Supreme Champion awarded to Susan Carr of Dumfries. A 21-year old underdog became the new Cumberland and Westmorland Wrestling World Champion in the 14-stone category. Ben Brocklebank, Warton, was delighted to win the final fight. 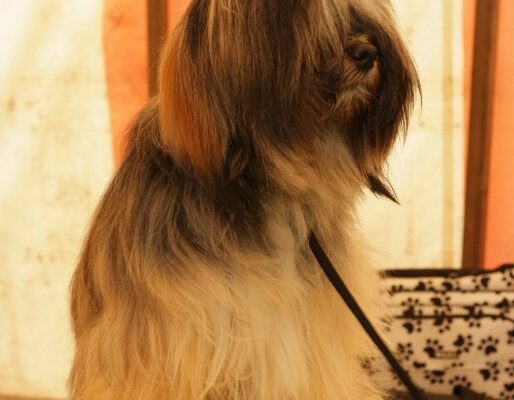 There were some challenges to be faced on Showday, mainly involving the approach routes. A number of accidents, flooding and muddy car parks led to traffic delays, all of which is currently under review for next year. The Food Theatre was buzzing with activity, as Phil Vickery made a guest appearance with two demonstrations, both to a packed and enthusiastic audience, alongside demonstrations from Luke Whittle & Callum Byerly, chefs of the Michelin Starred restaurant Forest Side. The infamous Westmorland Food Hall was the largest the Show has ever seen, and the vast array of locally produced food and drink was housed in a new marquee. One of the highlights of the day in the Food Hall was the huge bronze horse sculpture, displayed by The Plough at Lupton. Despite some slight difficulty in its installation, the sculpture was an impressive sight in amongst the colourful trade stands. The Society’s members this year benefitted from an extended Member’s Terrace which was very welcome in the wet weather. 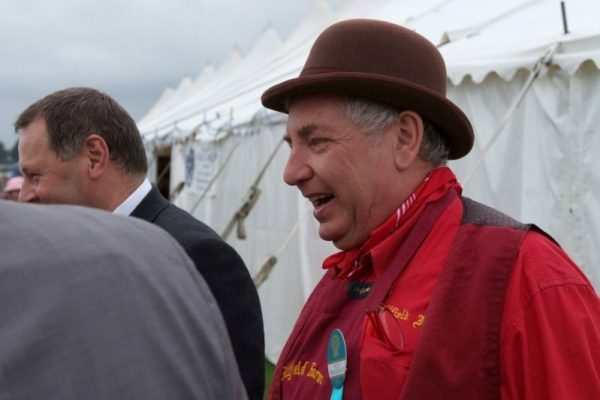 The rain, however, did little to quell the lively atmosphere within the Member’s Marquee, where old and new friends alike met to enjoy the hospitality and watch the Main Ring attractions from the Terrace. Marquees were packed with visitors and as usual the Learning for Life Marquee was home to magnificent displays, put together by local schools. 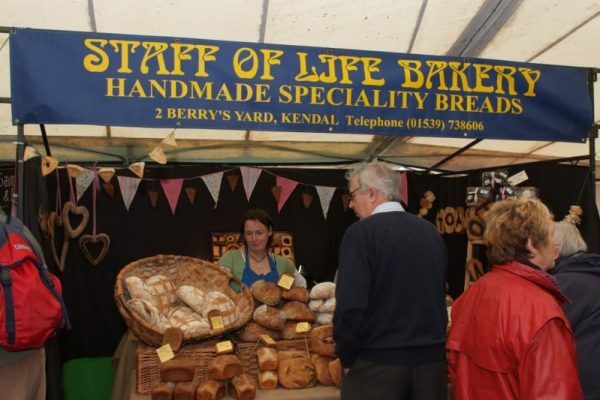 This year, Learning for Life was sponsored by University of Cumbria and it is safe to say that the standard within the marquee increases every year. 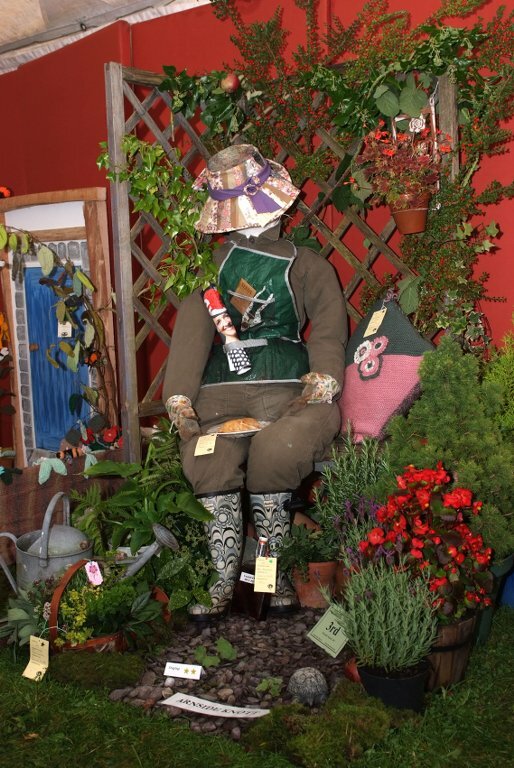 Yet more displays were to be seen in the WI Marquee, with Children’s Literature as the theme of the year. 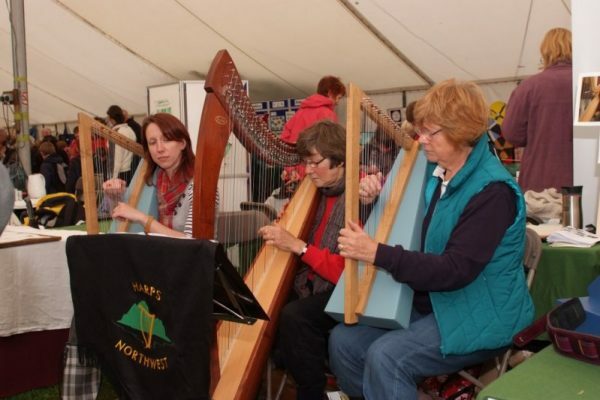 Ruth Rigg, Cumbria-Westmorland Federation chair commented on how fantastic it is that the WI is welcoming more and more young members and how they enjoy taking up the crafts. President David Fell with his wife Jane said that they had had a brilliant day. 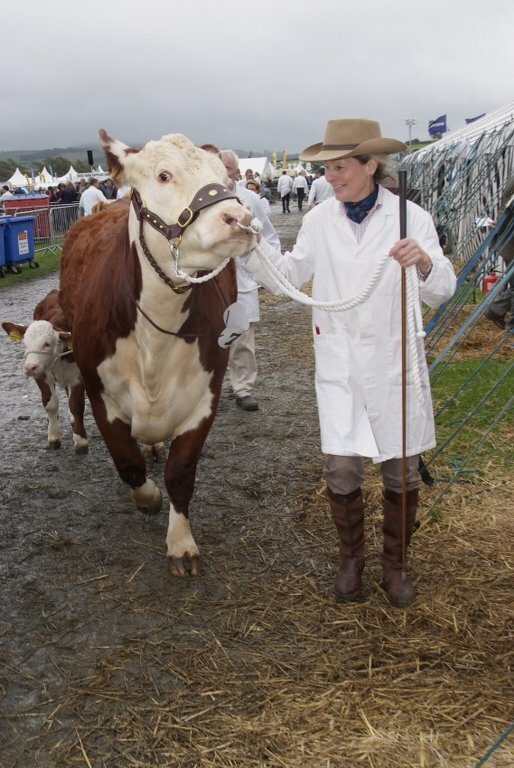 As is tradition, the President was escorted around the Showfield, and commented on the Shows fantastic atmosphere, regardless of the wet weather. A huge thank you to all the visitors, exhibitors, volunteer stewards and judges who supported the 217th Westmorland County Show showing the true spirit of Westmorland. 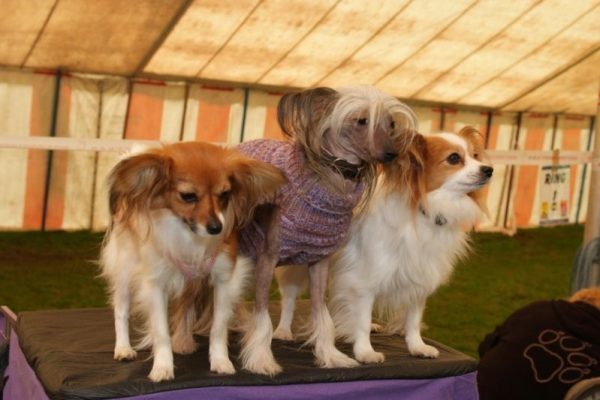 The next Show will take place on Thursday 14th September we hope to see you then! What a phenomenal day! 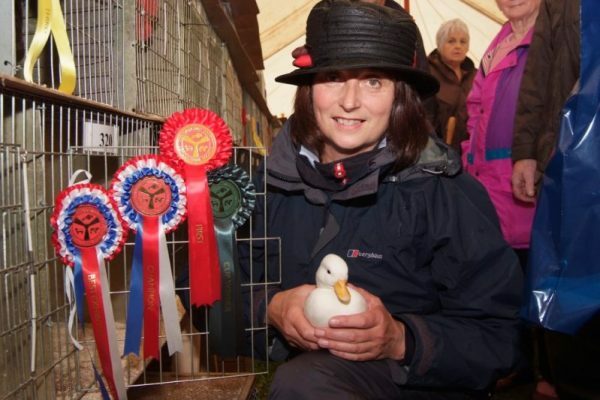 Westmorland County Show 2015 celebrated another record breaking year as 35,551 people converged for Cumbria’s biggest event in the agricultural calendar. 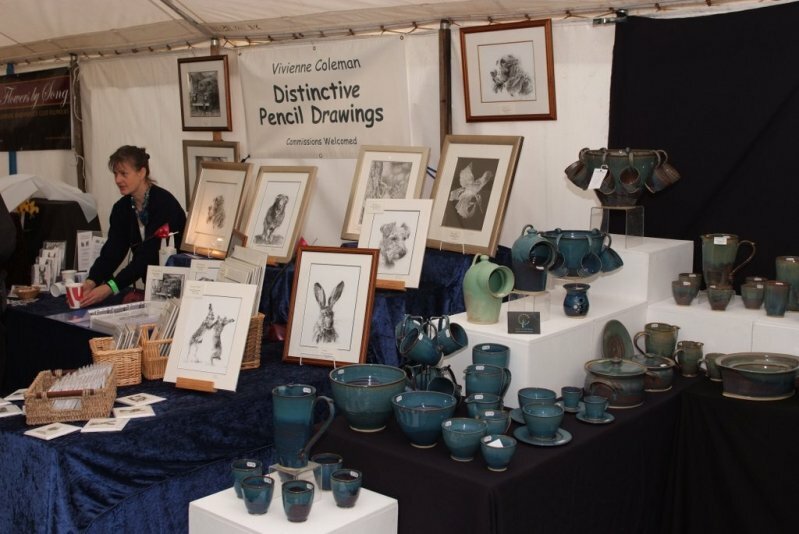 Again enjoying excellent weather, the fields were bursting with trade stands, the marquees packed and smiling faces could be seen throughout the Showground. Maintaining the stance to only permit cattle pre-movement tested for TB, the cattle section, sponsored by Carrs Billington, saw an increase in entries, with exceptional quality throughout. 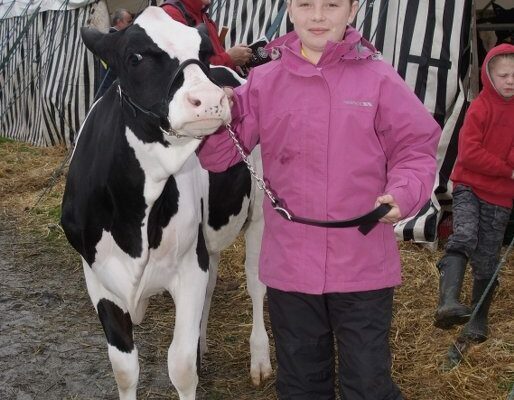 Leading the large dairy lines was the Inman family with an Holstein second-calver Witherslack Lauthority Annie, which was praised during the inter-breed judging for having ‚Äòbalance, quality and strength‚Äô. Bryan Ronan topped the beef inter-breed championship with a first-calved heifer with bull calf at foot, Jerusalem Lady Jane. 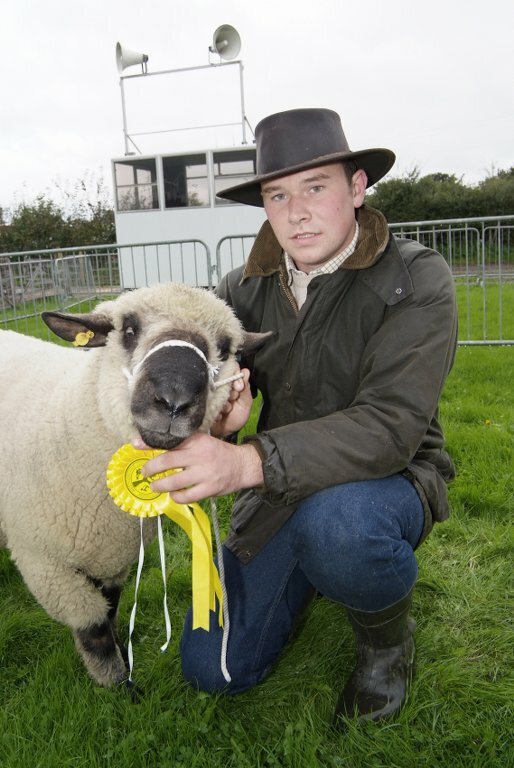 Young Handler classes in both sheep and cattle attracted record entries and keen competition. A J Walton’s Duroc, Deva Nancy 914, took the supreme pig championship which also hosted the National Tamworth Champion of Champions class for the first time, won by A J Brown travelling all the way from Somerset. 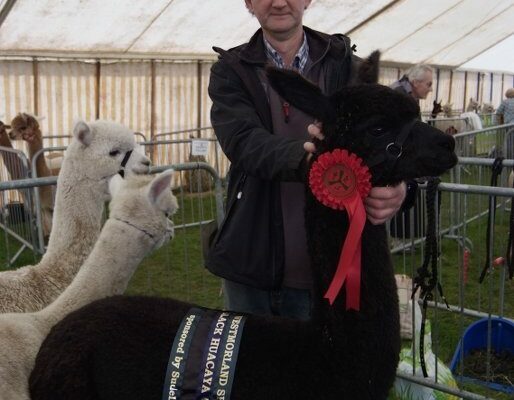 The alpaca section again reached capacity, with Barbara Hetherington taking top Huacaya honours with Beck Brow Bottoms Up. Best exhibit in the poultry section was won by J Johnson’s call duck. The equine section was as busy as ever with over 700 entries across the wide-ranging classes. 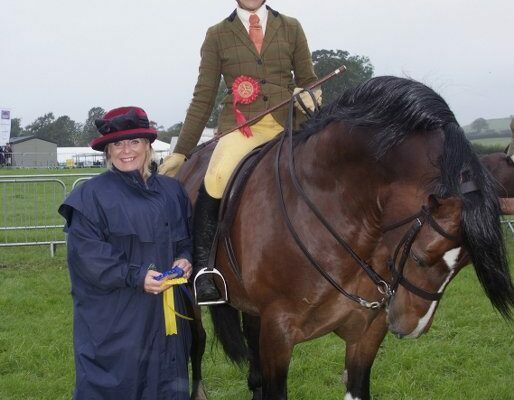 Supreme champion was awarded to Kathryn Phillipson who also took honours in the Ridden Hunter. 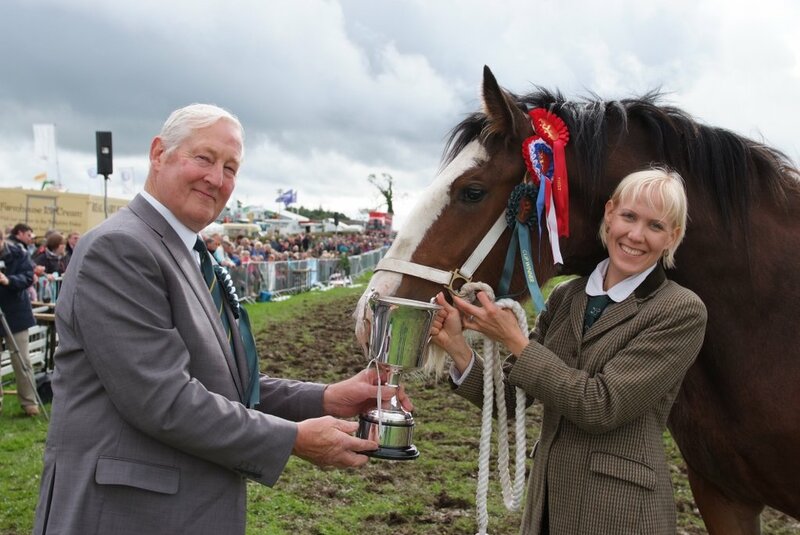 This year also saw a brand new award being made during the Grand Parade to the Champion of the Main Ring, with the inaugural winner, Ted Harrison of Barnard Castle with his Shire mare, taking home the trophy purchased from the Royal Show, acquired to preserve its provenance. 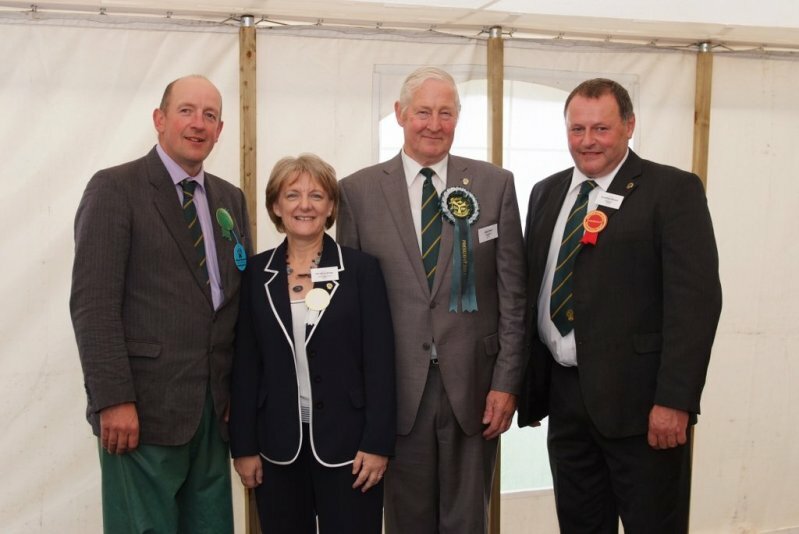 Minette Batters, NFU Deputy President, was a very welcome guest, and was particularly impressed by the quality and numbers of livestock exhibited, as well as the Society’s commitment to education. The Farmers Club returned, hosting a reception under the chairmanship of Anne Chamberlain. 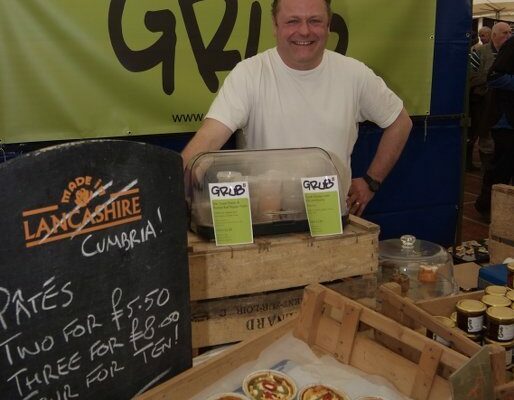 Mrs Chamberlain, along with Cumbria’s High Sheriff, Sam Rayner, also judged the Food Hall trade stands, with both being very impressed with the diverse range and high standards of the producers. 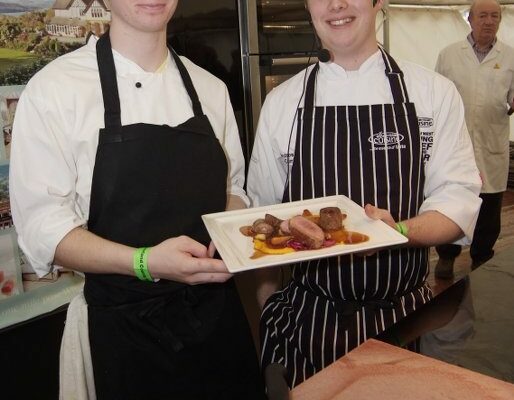 The Food Theatre’s culinary entertainment included the armed forces, who combined fine dining and combat rations to give a taste of food in the military whilst top class Cumbrian chefs included outstanding demos from Kevin Tickle, The Punch Bowl’s Arthur Quin and Lakeland’s Steven Doherty. 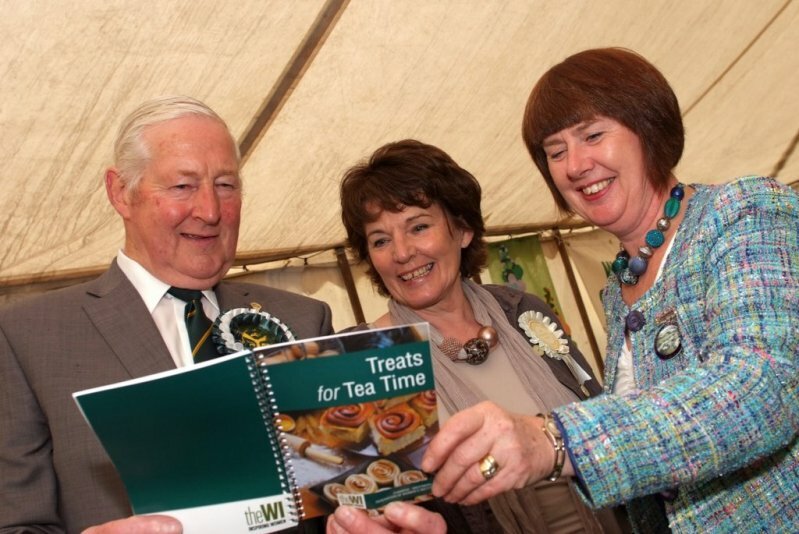 President, Wilson Garnett, along with wife Joan, enjoyed every minute of their special day, managing to visit most sections. Westmorland holds such special memories, said Wilson, topped off with son John winning the Best Managed Farm title. The Members area was almost bursting, with many taking advantage of the sunshine to watch the Main Ring activities well into the evening. Fully acknowledging the new parking arrangements, albeit much safer, did not meet either our own expectations or those of many of our Vice Presidents, these are being reviewed for next year. The marquees were again packed to the rafters with quality exhibits throughout. 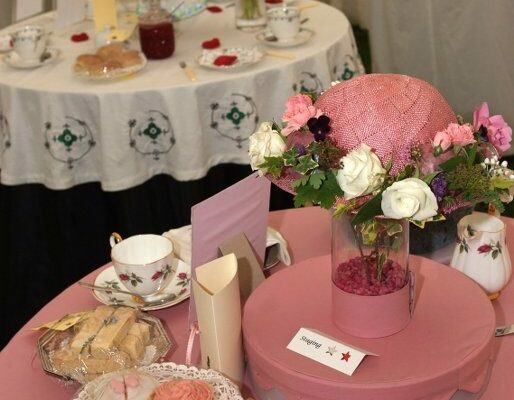 The WI continued their centenary year celebrations in style with members exhibiting over 1,000 entries. 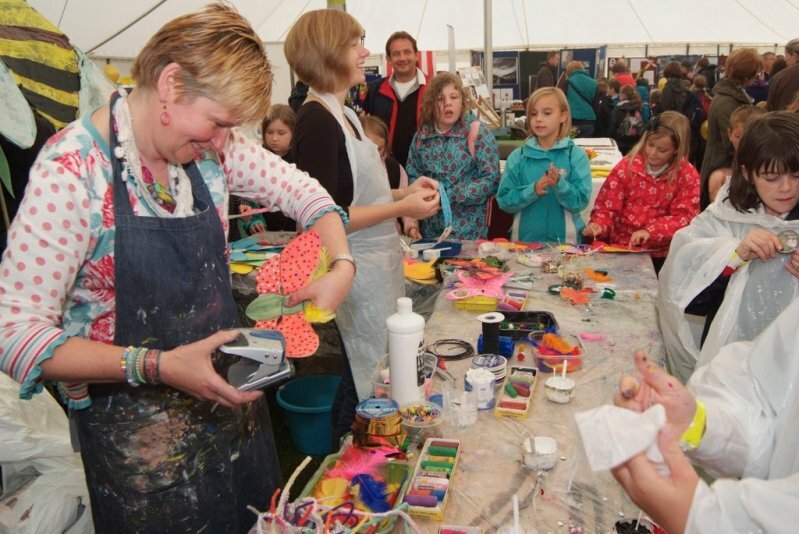 40 schools and 18 other educational organisations took stands in the Learning for Life Marquee, many of them interactive. 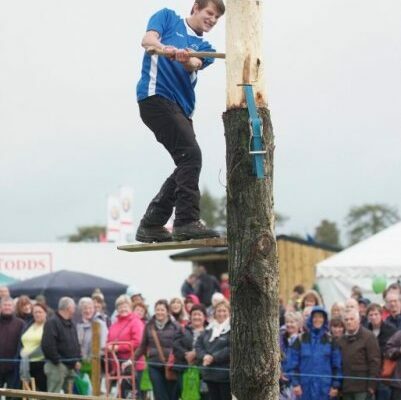 Meanwhile, competitors in the Cumberland & Westmorland wrestling area, including an Under-18 World Championship, played to an absolutely packed ringside, whilst the Cumbrian Axemen delighted the crowds with their breathtaking demonstrations. 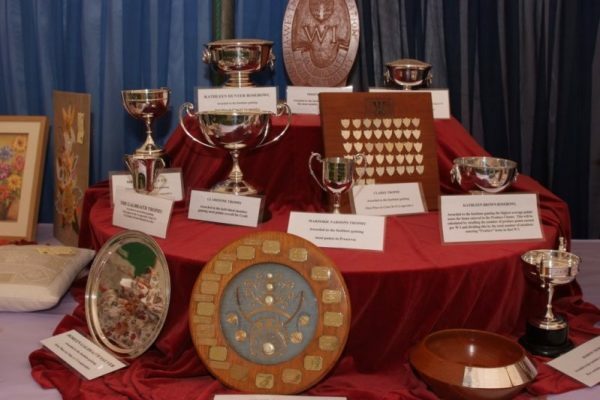 All in all, 2015 was a truly outstanding County Show, only made possible thanks to the visitors, exhibitors, volunteer stewards and judges who supported the 216th Westmorland County Show a huge thank you to you all. Simply phenomenal! From early morning, when the 215th Show opened its gates, eager visitors arrived in their droves. Being blessed with such excellent weather helped boost the crowd to an amazing 35,227 the highest in the Society history. 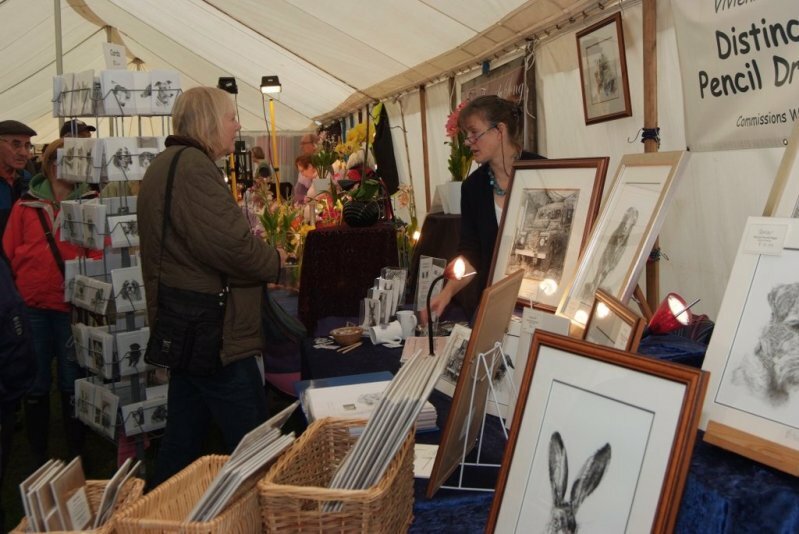 The fields were bursting with trade stands, the marquees packed and throughout the Showground smiling faces were everywhere. 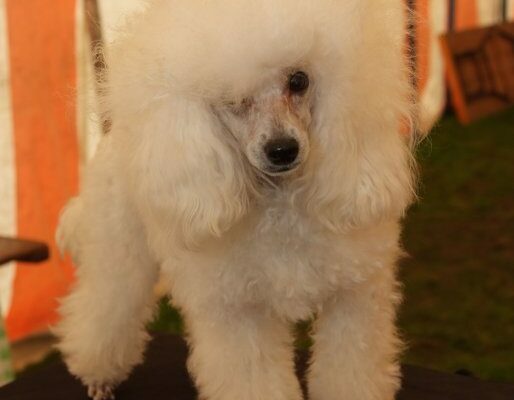 Just shy of 1,000 entries, the sheep section included Badger Face and Kerry Hill classes for the first time. 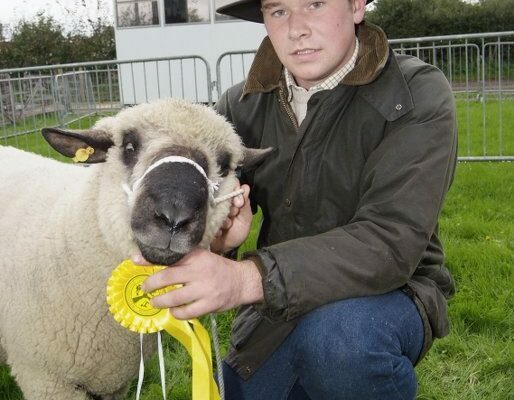 Leading the lowland terminal sections was a Charollais ewe from D & J Norman of Cockermouth, whilst Philip Dawson of Kentmere took the lowland non-terminal championship with his home-bred Bluefaced Leicester shearling ram. 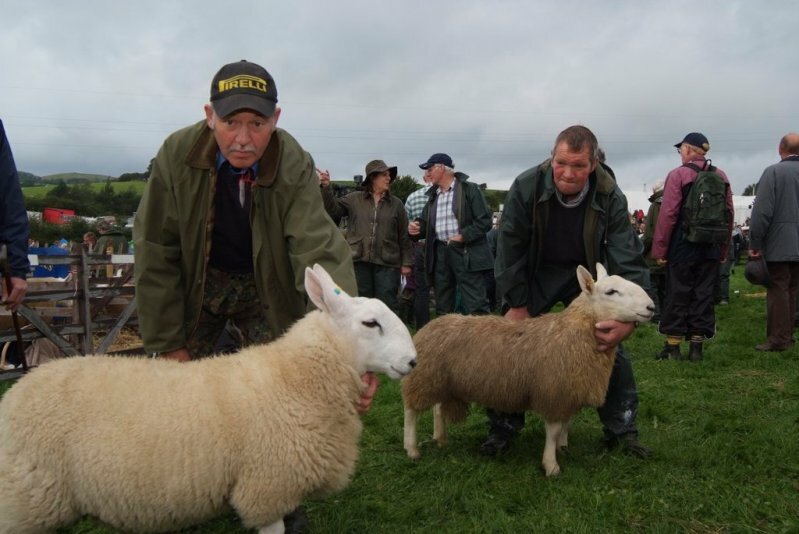 Stalwart exhibitors, Bryan & Jayne Knowles, Selside triumphed in the upland section with a Rough Fell ram. 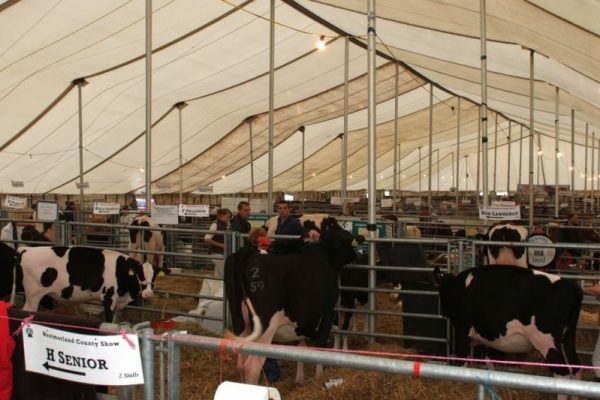 Despite reduced entries in the cattle section, partly following the decision to only permit cattle pre-movement tested for TB, the quality of exhibits remained exceptional. A British Blue from David and Lyn Watret, Lockerbie was crowned inter-breed champion of the beef section, whilst top honours in the dairy section went to Richard Baynes, Hexham with his Ayrshire cow. The Grand Parade was definitely a highlight, with all cattle breed champions resplendent in the new sashes, sponsored by New Breed. 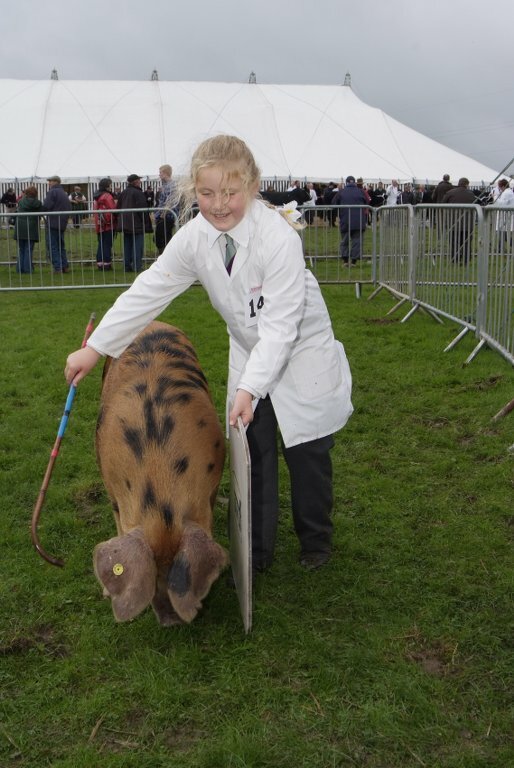 Young Handler classes in both sheep and cattle attracted excellent entries and keen competition, and the supreme pig championship was awarded to C & R Stewart’s Saddleback gilt, Clash Grand Duchess. 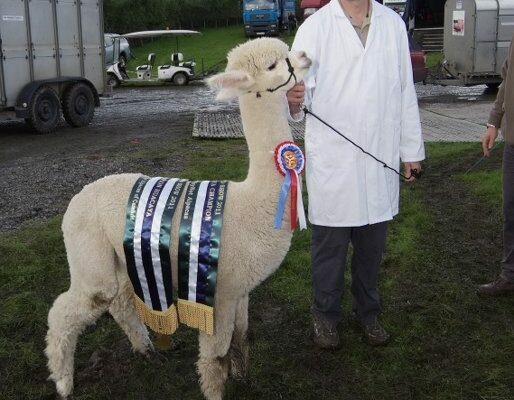 Entries closed early in the alpaca section, where top Huacaya honours went to Mrs Rippon of Barnacre Alpacas. 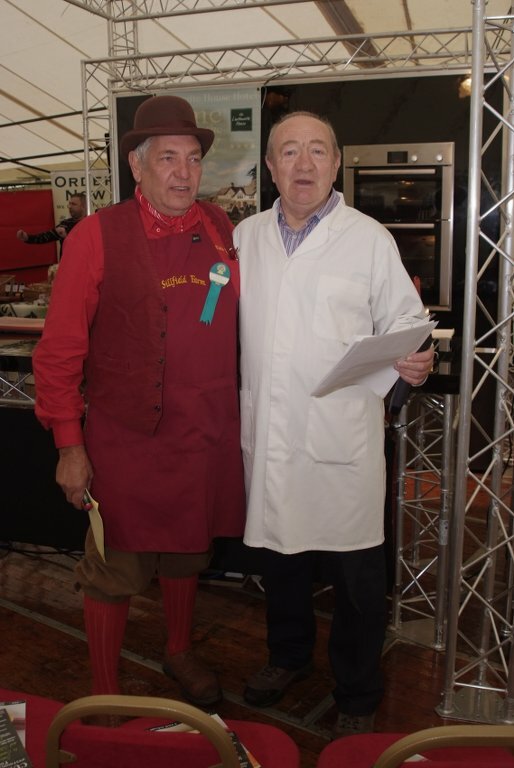 Best exhibit in the poultry section was won by S Rich with his modern game bird. Over 800 equine entries across the horse section ensured bumper classes, with supreme champion being awarded to Jayne Pimbley in the Ladies Hunter. 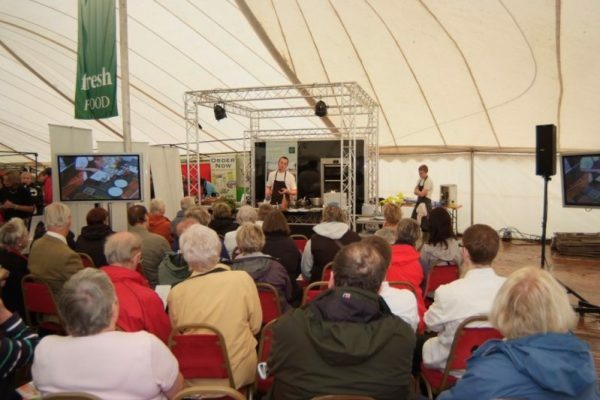 Among the special guests were National Farmers Union Vice President Guy Smith and TV chef Phil Vickery, who, returning for the second successive year, was a star attraction in the food theatre, with hundreds of people watching his demonstrations. We also welcomed the Farmers Club who hosted a reception under the chairmanship of Jimmy McClean. President, Bob Bond, along with wife Joyce, enjoyed a wonderful day visiting most sections. 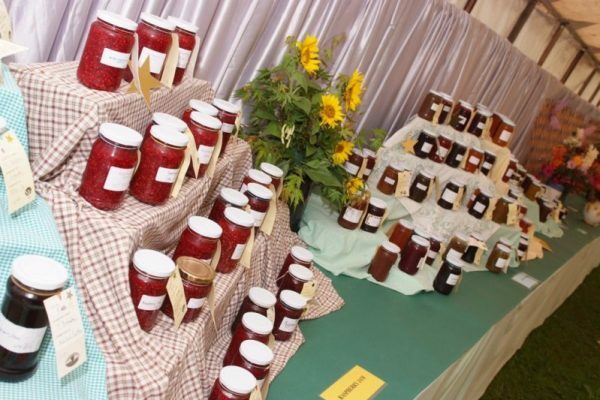 The Show just keeps improving and is a major showcase for farming in this area. The Members area was almost bursting, with many taking advantage of the sunshine to watch the Main Ring activities well into the evening. 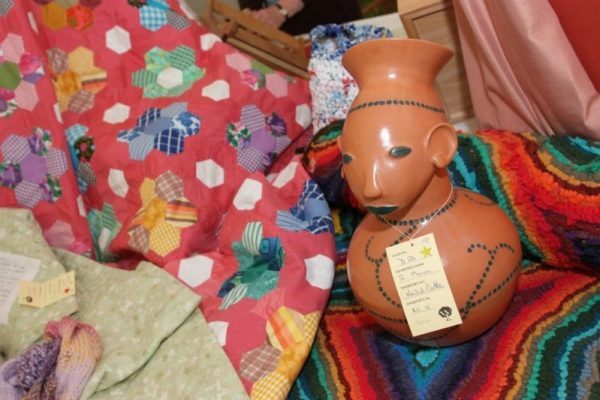 Almost 40 exhibits were on display in the extended Vintage area, and Stuart Barnes of the Sheepshow declaring he had never entertained so many people in one day before. Every performance was amazing, with literally hundreds watching. 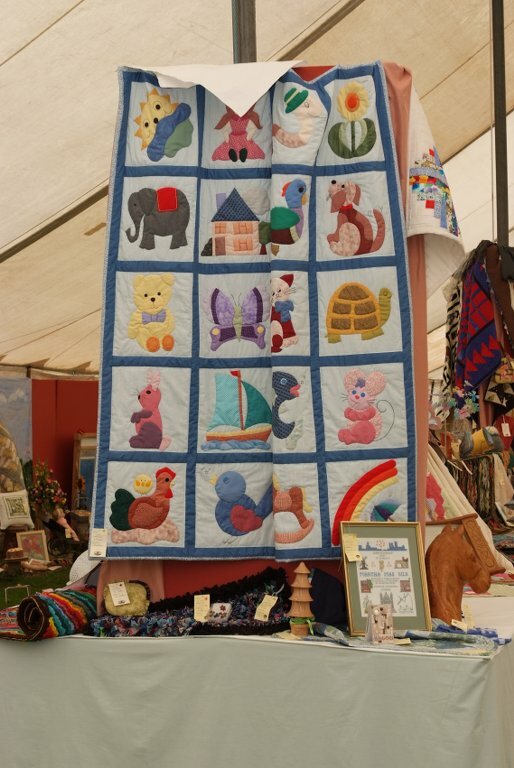 The marquees boasted quality exhibits with almost 50 stands in the Learning for Life Marquee, many of them interactive, whilst the WI’s Country Calendar theme resulted in magnificent displays from throughout the county. 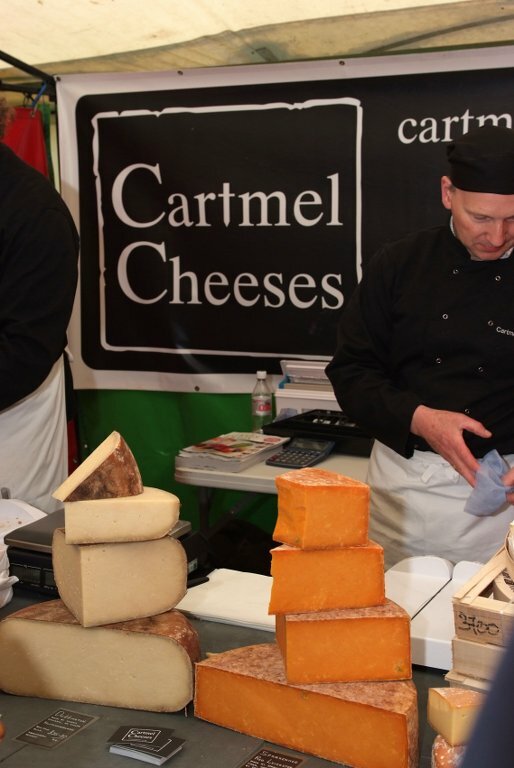 Meanwhile the Food Hall was a festival in itself showcasing more producers than ever before. 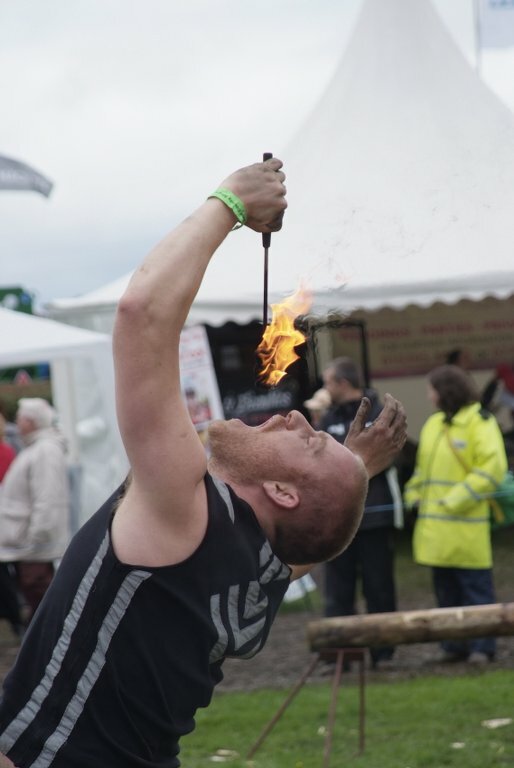 Competitors in the Cumberland & Westmorland wrestling area played to an absolutely packed ringside, whilst the Cumbrian Axemen delighted the crowds with their breathtaking demonstrations. 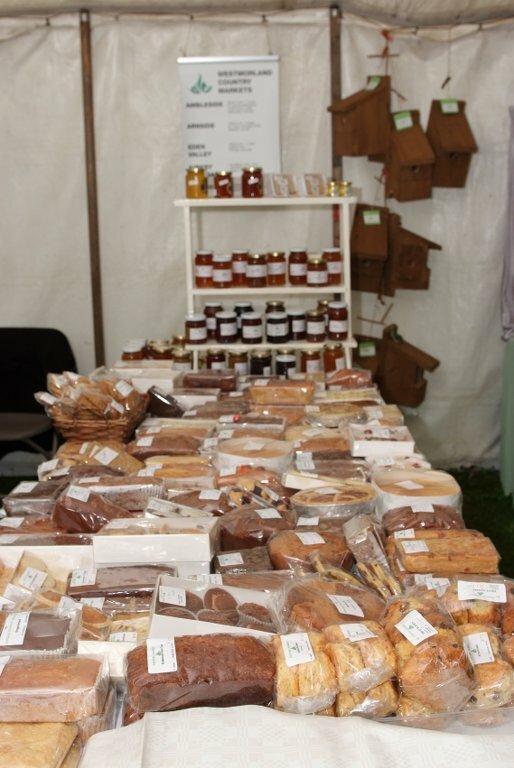 Without doubt there was something for everyone and a magnificent day out, only made possible thanks to the visitors, exhibitors, volunteer stewards and judges who supported the 215th Westmorland County Show a huge thank you to you all. The 215th Westmorland County Show attracted excellent entries in the light horse section under new Chairman Shirley Bennett and her hard working team with over 12 hours of top class showing. The overall supreme championship was judged by Ann and Les Park, who celebrated their diamond wedding the previous day and their choice was Jayne Pimbley (Nee Wilson) from Out Rawcliffe riding Lisa Clarke’s five year old Deaville by Demonstrator out of Double Take bred by Chris Wheatley. Jayne was absolutely to win the Joe Wardropper Supreme and took the Ladies Hunter and qualified for next years Royal International.Jayne took the hunter championship and wins this season includes Royal Three Counties and qualified for Horse of the Year Show at The Royal Highland. 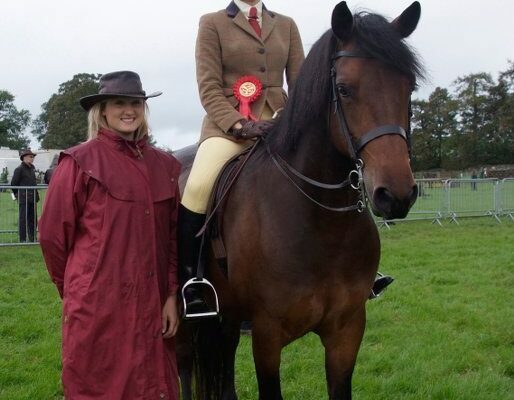 Laura Rowe from Blackpool took reserve champion in the hunter section scoring a double win and two tickets for International riding The Marksman after winning the Amateur Heavyweight riding The Marksman. The open hunter International qualifiers produced a double win for Bolton‚Äôs Clare Elding with her heavyweight Papavers Romeo while the lightweight was won by Katrina Braithwaite’s seven year old Kilderry Rupert by Cloneen Clover.E.Stuart from Perthshire took the small hunter qualifier riding Bolero Greenfield ahead of Penrith’s Christine Stamper riding the 19 year old Lough Crew giving Christine two tickets having been runner up in the working hunter to Northallerton’s Alice McCullagh riding the six year old Celine Tattie. Michelle Geldart won the unaffiliated ridden horse tricolour with her hunter Farm Boy and reserve going to Barrow’s Joanne Heap riding Northern Chapter with other section wins going to Glen Allen’s Carnsdale Kings Empress; Lauren Newsham-Wood on Phamthom Grace; Vikki Smith on Wreck It Ralph. The Skewbald & Piebald International qualifiers produced a good championship with Barnard Castle’s Sammi Elliott riding Kath Allen‚Äôs six year old Millpond Look So Special by Honeypot Sporran which was a top winner at this years Royal International ahead of pony’s 11 year old full brother Look So Different ridden by Libby Colmer who won the unaffiliated side saddle. Last years champion Michelle Cuerden riding Del Boy V with other qualifier winners being Liz Cross on Francil Silas and Clare Miller on Made By Design.The latter took the strongly filled in hand ahead of Ingrid Reid‚ Woody 111 with Victoria Brooks who took the unregistered ridden; Victoria from Old Hutton took her HOY ticket at NPS Championship and supreme ridden at CHAPS Championships. The ridden mountain mountain & moorland Championship judged by Barbara Rich and well known producer Julie Templeton was won by Arnside, Victoria Earl riding the lovely moving Dales pony Leadgate Black Phamthom by Waterside William 11; Victoria was highly delighted to take her section with Emily Myerscough riding the Highland pony Balmoral Merlin bred by H.M.The Queen owned by Lynda Crayston and took reserve with Emily Myerscough. Five year old Samantha Taylor from Endmoor took the mini championship riding the Yorkshire bred Dartmoor pony Langfield Lord Azriel led by her aunt Rebecca Abba with reserve going to HOY bound Grace Wood ridingPulmar Padgent with first ridden going to Abbie Kirkbride riding the Yealand bred Dykes Heathermead.Samantha‚Äùs eight year old sister Olivia took the ridden pony championship riding the Lincolnshire bred Daldorn Chi Chi ahead of Lilly Jackson riding Fae Dilks‚ Kiltattie Georgie Porgie. The fell championship judged by Jenny Crane chose Julie Robinson riding Lunesdale Aurora bred by Carol and Bert Morland which took reserve supreme and won the ridden fell ahead of her niece Anna Metcalfe riding HOY bound Lunedale Warrior Queen. The working hunter produced some good performances over Rachel Turner‚ excellent with overall champion going to Mollie Jeffrey riding Doylan Chilli Pepper ahead of Nikkitta Guy’s Silver Star Lad. 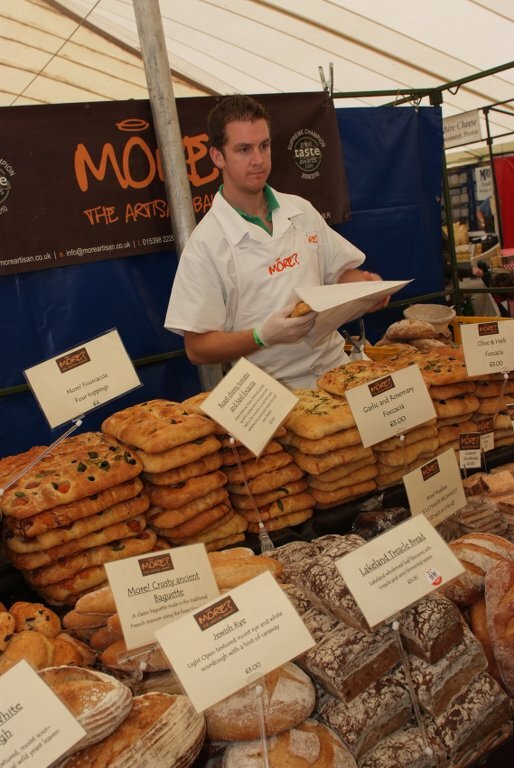 Record entries, a royal visit, a celebrity chef and tremendous support resulted in a truly outstanding Westmorland County Show. 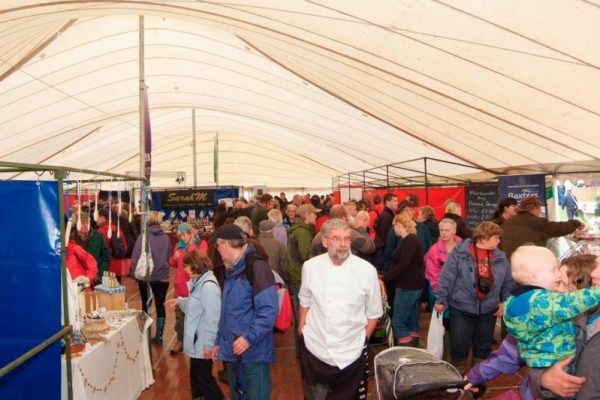 Enjoying its second highest attendance, more than 30,000 people flocked to the Crooklands Showground to enjoy the sights, sounds and atmosphere of one of the oldest and largest one-day agricultural events in the country. 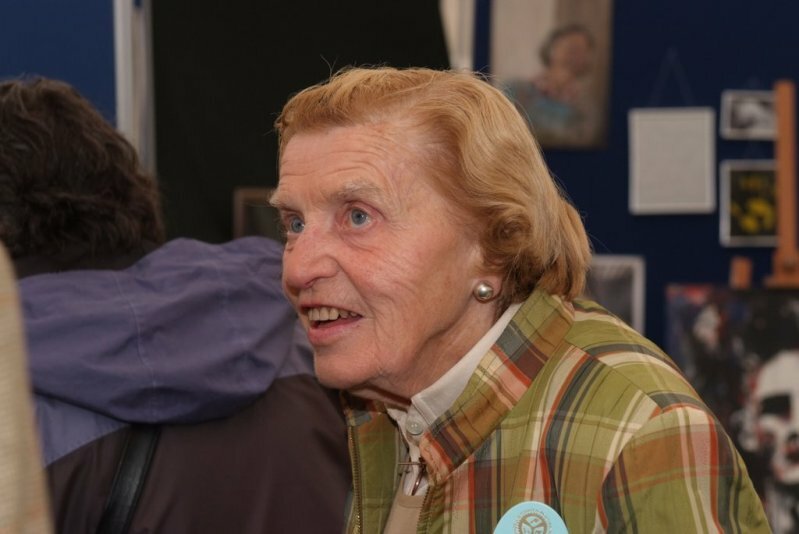 Every year is special but 2013 has certainly been a landmark with the first ever Royal visit in our 214-year history, when we were honoured to welcome HRH The Countess of Wessex to the Show (photo story inside). 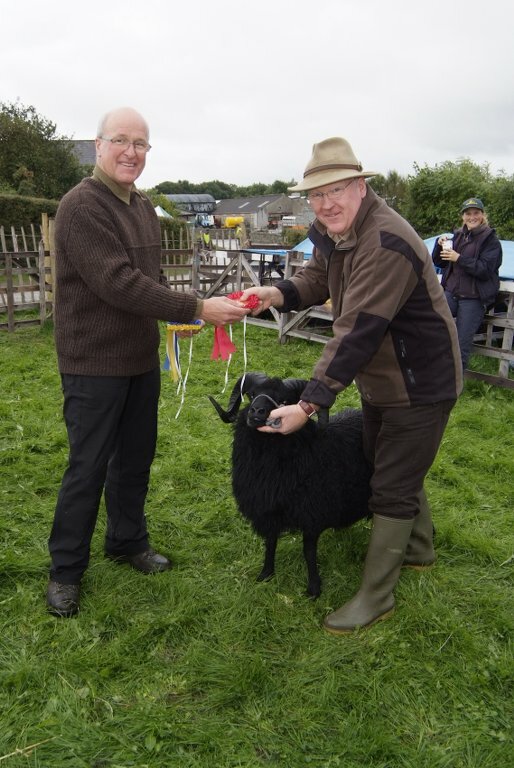 A record 1,026 entries exhibited in the sheep section, which included the first Zwartbles Northern Show. Much to the delight of President Tom Gorst, first-time exhibitors at Westmorland, Dr & Mrs Giles Horner from Whitby took the lowland non-terminal championship with their Teeswater whilst Peter Woof of Stainton‚Äôs Texel took the lowland terminal honours. Keith & Elaine Stones triumphed for the eighth time in nine years taking the upland title. Just 2 shy of the 2012 record, the cattle section attracted 478 entries, which included a Beef Shorthorn section for the first time. 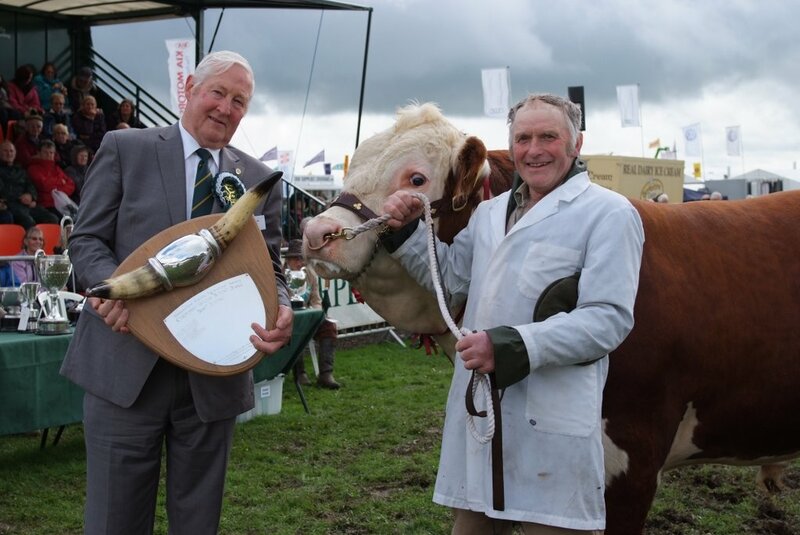 The overall beef championship was awarded to PR Dawes home-bred limousin cow, Dinmore Elegance, travelling from Hereford, whilst top honours in the dairy section went to Messrs Butterfield of Bentham. 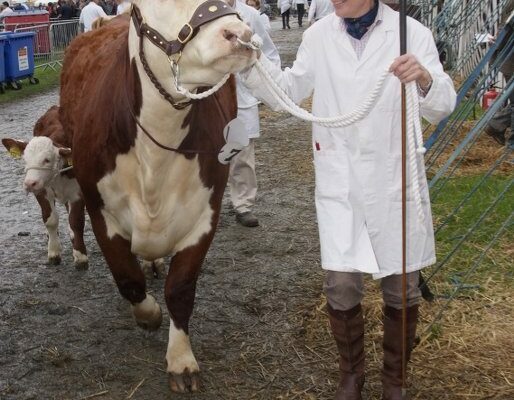 The Grand Parade was definitely a highlight with more cattle than ever taking part. Young Handler classes in both sheep and cattle attracted record entries and keen competition, whilst the supreme champion pig championship was awarded to 18-year old Sarah Whitley with her Gloucester Old Spot boar, Birchfield Rufus. Entries in both the alpaca and poultry sections increased, with 136 exhibits in the egg classes alone. 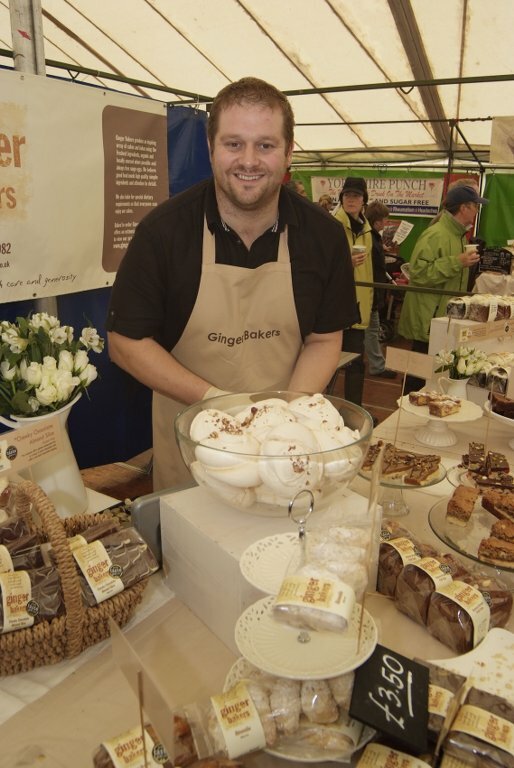 Among the special guests were National Farmers‚Äô Union Vice President Adam Quinney and TV chef Phil Vickery, who was a star attraction in the food theatre, with hundreds of people watching his demonstrations. 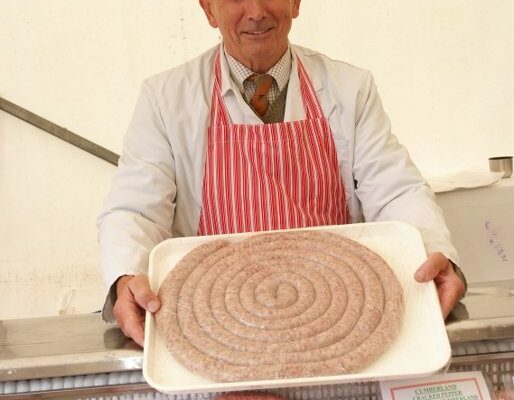 Alongside compere Peter Gott, Phil showed visitors how to make and cook Cumberland sausages. 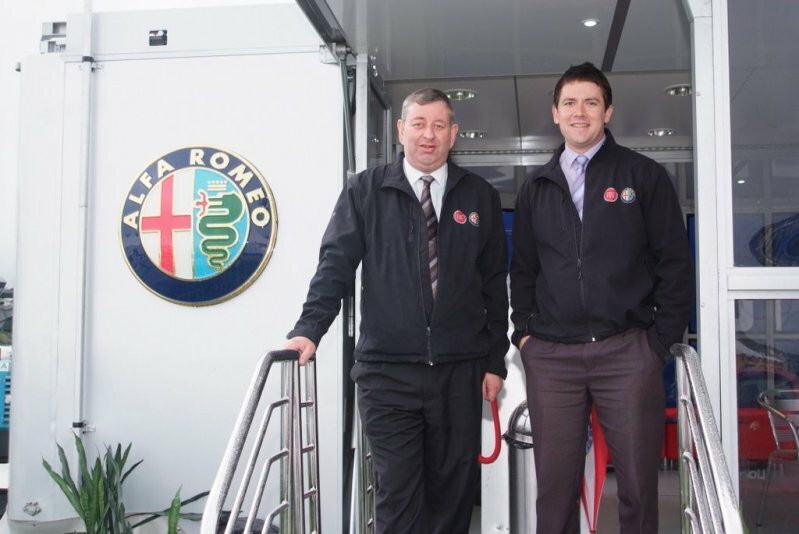 Relocating the Members marquee to the newly created terrace area overlooking the Main Ring was hailed a great success, with nothing but positive comments received. Almost 40 exhibits were on display in the extended Vintage area, including newly-weds Edward & Charlotte Woof‚Äôs wedding tractor. 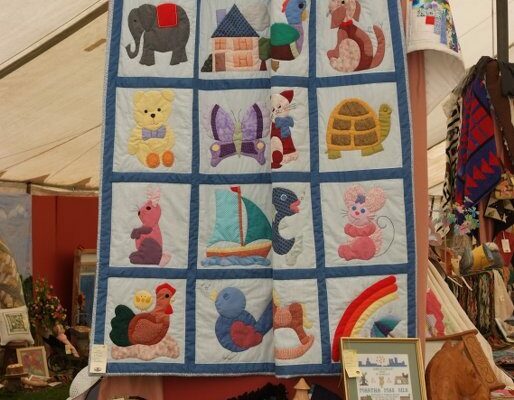 The marquees boasted quality exhibits with almost 50 stands in the Learning for Life Marquee, many of them interactive, whilst the WI‚Äôs ‚ÄúOn the Wild Side‚Äù theme attracted over 1,000 entries from throughout the county. 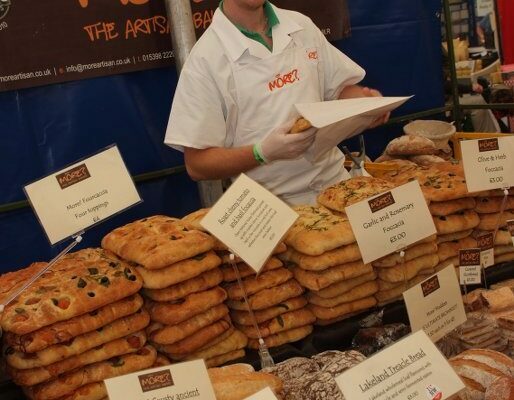 Meanwhile the magnificent Food Hall was a festival in itself showcasing more producers than ever before. 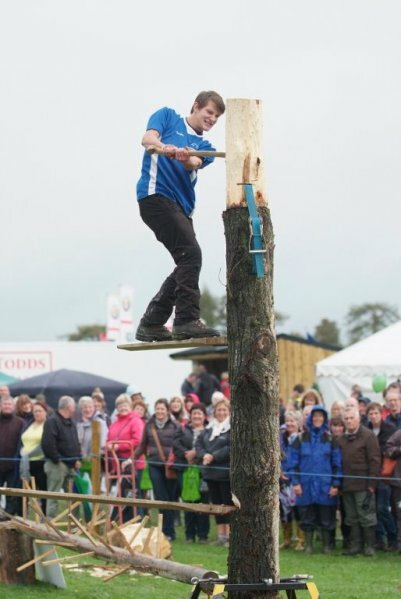 Alongside the ever-popular Sheep Show, competition in the Cumberland & Westmorland wrestling area played to a packed ringside, whilst the Cumbrian Axemen delighted the crowds with their breathtaking demonstrations. 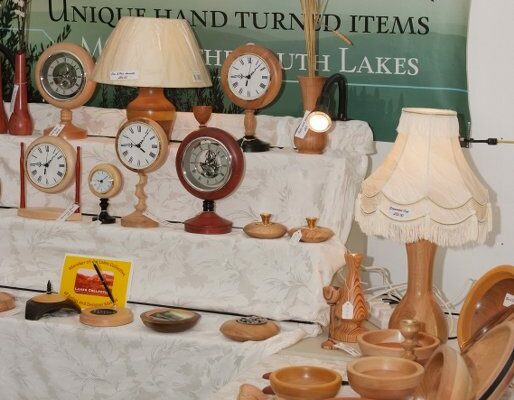 Without doubt there was something for everyone and a great day out, made possible by the visitors, exhibitors, volunteer stewards and judges who supported the 214th Westmorland County Show ‚Äì a huge thank you to you all. 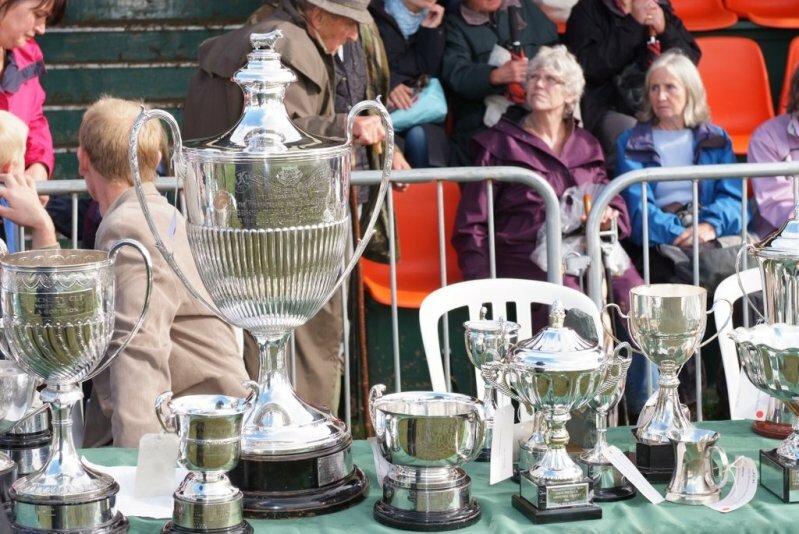 Carol Hodgson, Chief Steward of the light horse section and her hardworking team worked hard to keep all sections going at the 214th Westmorland County Show with excellent announcing by Simon Richardson also superb working hunter courses by Rachel Turner from Huddersfield. 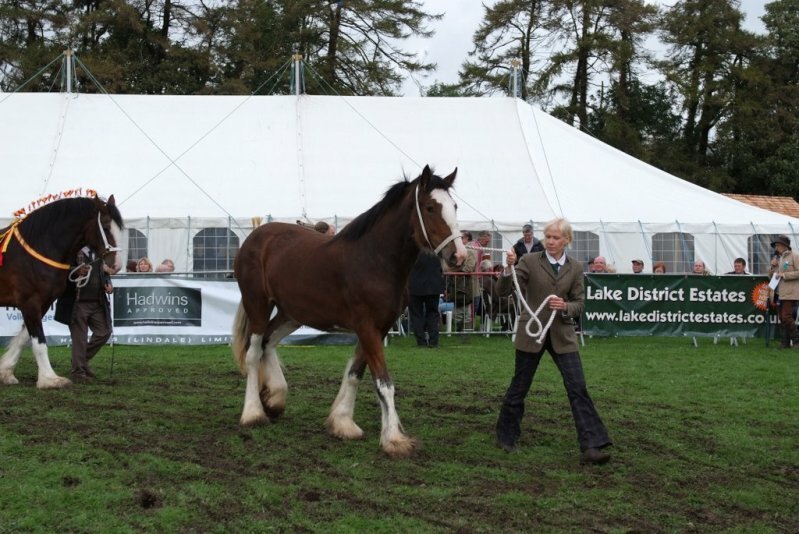 The overall supreme of show was judged by Carol and Bert Morland of The Lunesdale Fell Ponies; Tebay and their choice was the ridden show pony champion Madison Steadman from Burnley, riding the seven year old mare Barkway Magic Moments by Beckside Little Toff and led by her mother Emma.Madison, Emma took over the pony after it won Horse of the Year Show last year when it won with Zara Clark-Jones and been a prolific winner this season at Lancashire venues. The reserve was Kate Watson from Barrow riding Glens Cockbain‚Äôs six year old Dales pony mare Tarbarl Mary Jane by Carrock Billy Boy Kate won the overall mountain & moorland ridden championship and had wins this season at NPS Area 4 in hand and ridden at White Rose County, NPS Summer Championships and BSPS Area 1B. Kate also took the overall tricolour at Witherslack Horse Show three days later. The fell pony championship went to David Morland from Tebay showing his daughter Rebecca‚Äùs six year old Mare Greenholme Beauty by Lunesdale Red Star bred by Bill Potter and won at Reeeth and Cartmel besides last years reserve supreme at Breed Show. Stamper (nee Richardson) riding W Regal Wood who claimed two tickets for next years Royal International with reserve going to Glossop‚Äôs Jenna Tydlesley riding Tudor Minstral, double winner and champion at HOY last year. Cuerden riding Del Boy V with reserve going to Kendal‚Äôs Glen Allen riding his aunt Kath‚Äôs Millpond Look So Cheeky; the latter will be compeing in two finals at HOYS and was supreme at Derbyshire Festival and CHAPS Northern Show, Richmond. Alasdair Prickett from Farleton riding the Irish bred Rocheston Prince scored a hat trick in the working hunters including The Jennifer Harrison Memorial Trophy. Alasdair is bound for HOYS after qualifying at the BSPS Welsh Championships and also was reserve supreme working hunter at the Lancashire Championships and reserve Novice Champion at same venue. 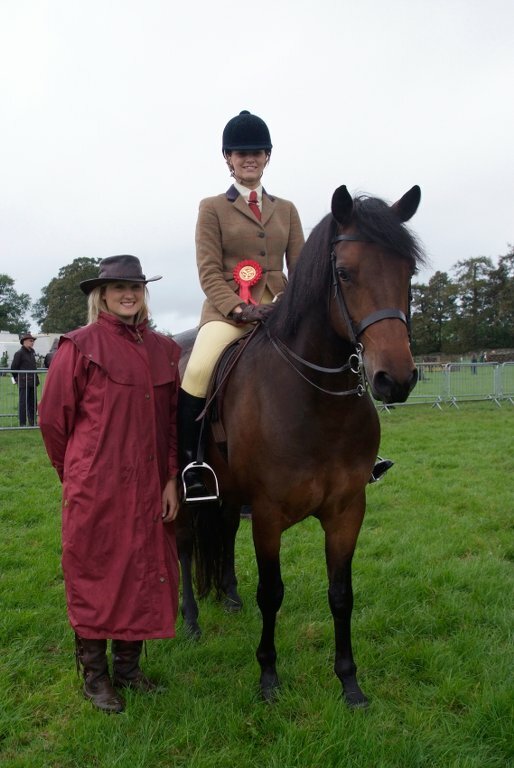 Beth Moore from Hincaster took the Equitaion Championship riding Prince of Spies. 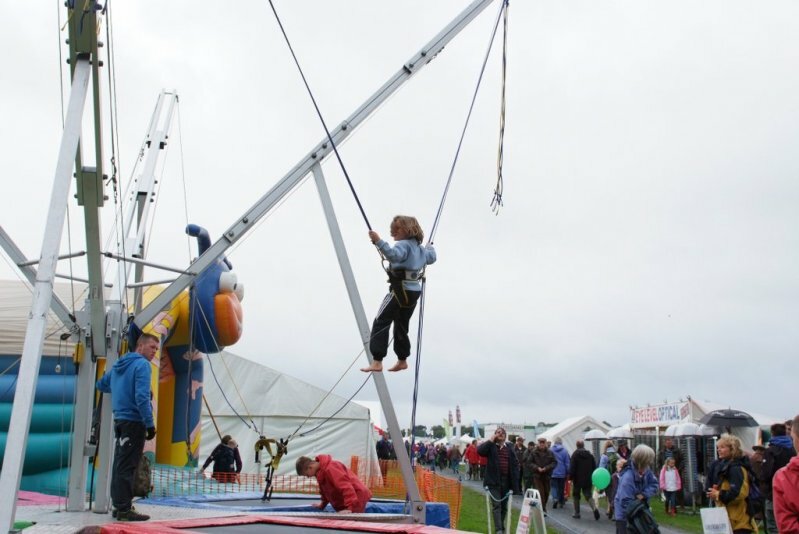 Westmorland County Show enjoyed its third highest attendance on record, with more than 29,000 people flocking to the Crooklands Showground to enjoy one of the largest ‚Äì and oldest ‚Äì one-day agricultural events in the country. From early morning when the 213th Show opened its gates, eager visitors were able to enjoy a fine morning as livestock judging got underway. And although a heavy shower did arrive in early afternoon, the stoical show-goers were determined not to let it spoil their enjoyment. 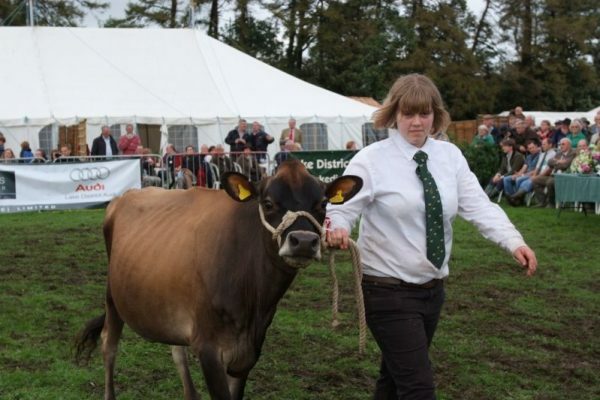 Equalling 2011‚Äôs record, the cattle section attracted 480 entries, including the Galloway Cattle Society‚Äôs national show, which brought exhibitors from Scotland to Devon! The overall beef championship was awarded to S&H Illingworth of Lockerbie by Mr J Cliffe representing Barclays, who sponsored the cattle section. With double honours, Richard Batty of Skelsmergh took both the lowland terminal and non-terminal Championships with his Suffolk and Mule respectively, whilst Keith and Elaine Stones won the upland inter-breed for the seventh time in eight years. 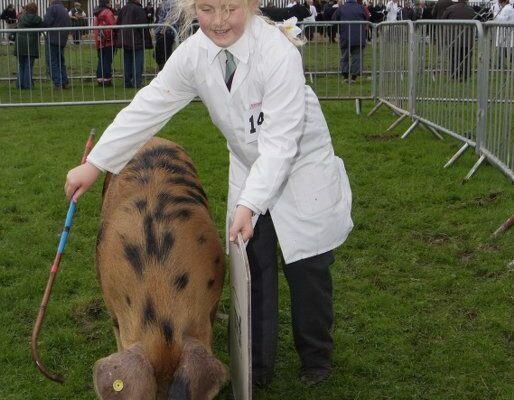 From over 100 entries, Imogen Sutcliffe, aged just 9 years, was awarded the supreme pig championship with Burma Judy, a Hampshire sow. 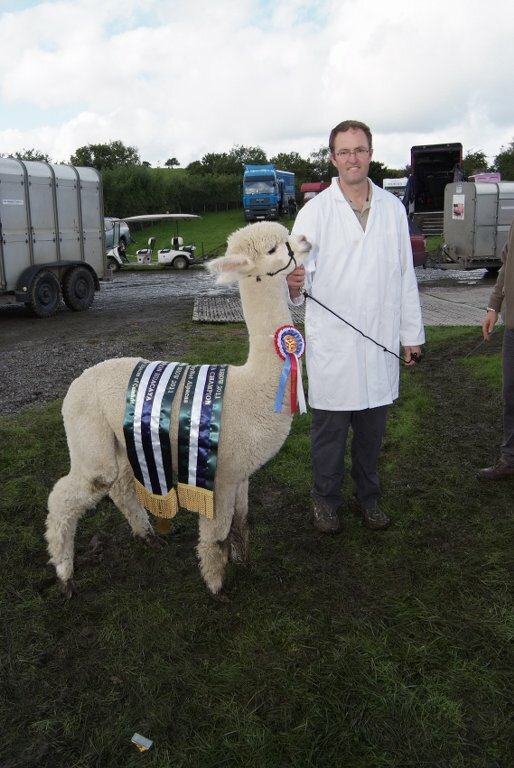 Entries in both the alpaca and goat sections increased and the poultry section enjoyed their move to the Countryside area. 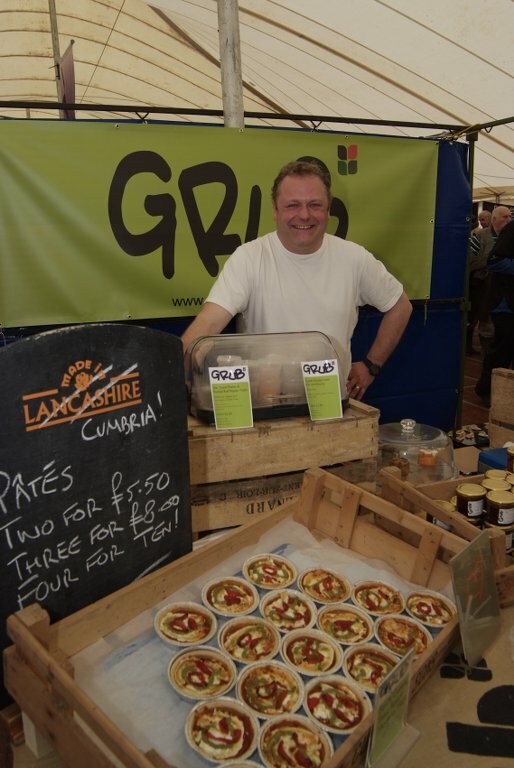 Among the special guests were National Farmers‚Äô Union President, Peter Kendall, who also presented trade stand prizes in the prestigious Westmorland Food Hall, where he was most impressed by the quality and diversity of products from over 60 local producers. 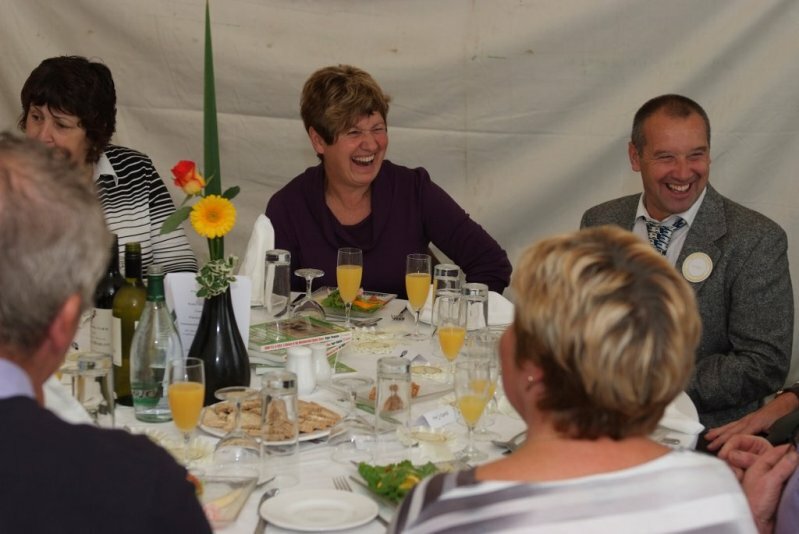 Extending into the ‚Äúpylon‚Äù field, the new layout was hailed a success with over 130 guests enjoying hospitality in the Westmorland Marquee, relocated to the newly created plateau area, which provided magnificent views across the Showground. 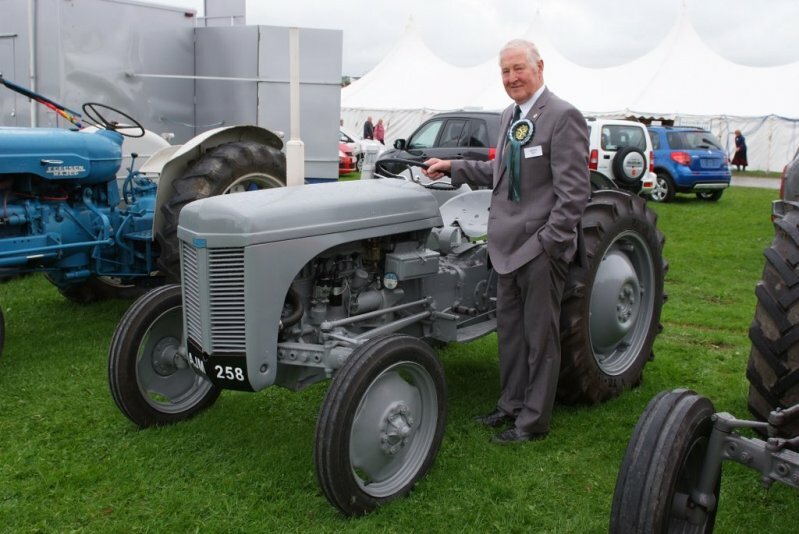 Congratulations to Mr Philip Ireland, whose Fordson Major was selected as President‚Äôs Choice in the vintage section. 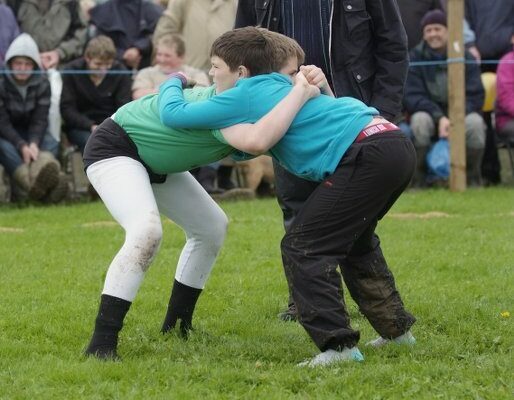 Keen competition ensued in both the Cumberland & Westmorland wrestling, which included a World Championship in the 14-stone category, and the YFC Tug of War. Having hosted a HOYS Grade C Show Jumping qualifier for the first time, sadly the later classes were cancelled due to the sodden ground. 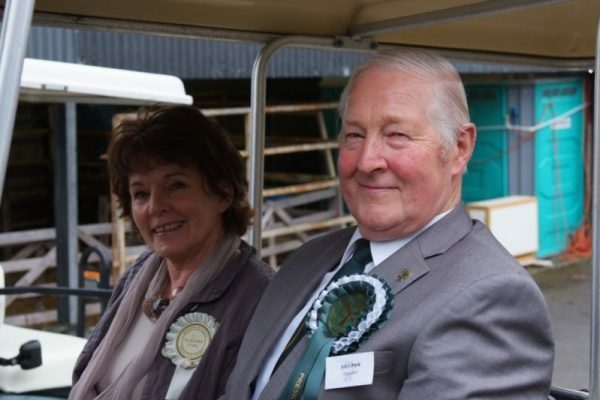 President, Hal Bagot, along with wife Susie, thoroughly enjoyed his day ‚ÄúThe Show is a major showcase for farming in this area and the organisers pulled it off superbly. There was a vast amount for people to see and hopefully many more will now appreciate where their food comes from.‚Äù Long service awards were presented to a record 10 recipients, including WCAS Showfield Director, Stephen Procter. All in all, a magnificent day, only made possible thanks to the visitors, exhibitors and volunteers who supported the 213th Westmorland County Show. Thank You. Christine Richardson from Bonniemount; Penrithtook the light horse supreme championship judged by Ann Hallam from New Hutton; Christine was riding the eight year old W Regal Wood which clinched two tickets for next years Royal International Horse Show ;Hickstead in the lightweight ridden hunter; Christine; granddaughter of Sheila Burne who bred ponies in hand was delighted to win the Joe Wardropper Memorial Trophy and only had the horse for three weeks which was bought off wellknown producer Charles Le Moignan. 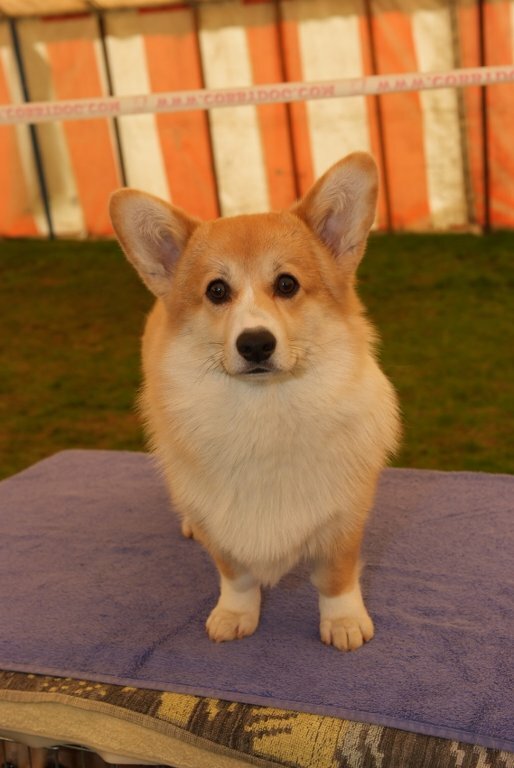 Christine also won her International ticket in the heavyweight amateur class with Unrico and also the open working hunter with the 16year old Lough Crew repeating last years performance. 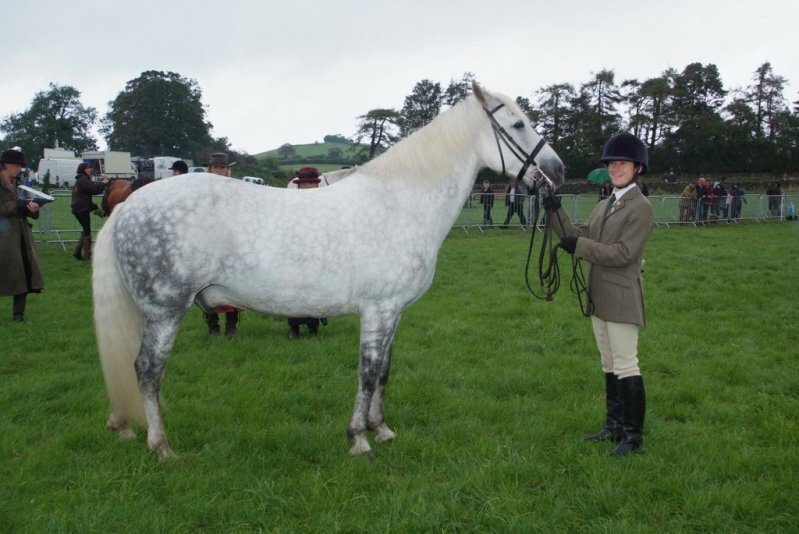 Lough Crew was also ridden by Elizabeth Appleby from Appleby which took the open working hunter pony championship and the Jennifer Harrison Memorial Area 1B Championship. The mini working hunter championship went to Alexander Gaynor=Smith from Garstang riding Chester V; following in the footsteps of his mother Catherine who had great success several years ago with the great Timberwolf. Glen Allen from Kendal took the mountain & moorland working hunter championship with Windle Dark Star taking the novice section ahead of Barrows”s Kate Watson riding Peasedown Artful Dodger;Kate also was reserve champion in the ridden mountain & moorland championship with Kirtle Onyx which was won by Tracey Milward from Rossendale with Coldwell Danny Boy.Emma Boardman won the Dartmoor;Exmoor Shetland ridden section with Dykes Lilymead bred and owned by Ann Rigby from Yealand out of Dykes Daisymead which celebrated her 25th birthday in May. Chloe Thornton from Lupton took the Welsh B &C with Oakmill Wizard which was a triple winner at the Ponies UK Summer Championships. The mini championship went to Olivia Meteiko -Taylor from Burnley with Cayberry Atlantic Chilli while Olivia Taylor took the lead rein with Doolittle Tattiboogle. Olivia “s mother Chrissy Knipe took the championship in the unaffiliated ridden championship with Katie Parkinson”s Renelles Royal Extravanganza; which had a good championship win at Richmond in June while Lauren O”Hagen rode the New Forest pony Mallard Wood Oliver to clinch the Equitation Championship with Katy Stock from Lambrigg taking reserve with her nursery winning mount Blue Cross Briar. 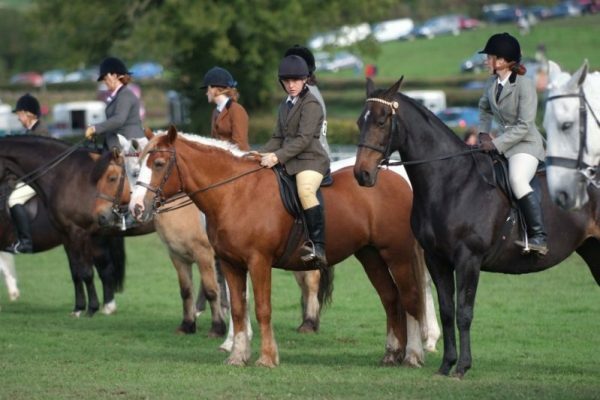 The skewbald & piebald championship produced a good win by Lucy Sanders from Northumberland riding Saint America with reserve going to Ulverston “s Emily Myerscough riding Tallyrock Diamond both claiming International 2012 tickets; Emily”s sister Lydia claimed a ticket with Bright Thinking along with Glen Allen and his profilic winner Millpond Look So Cheeky. 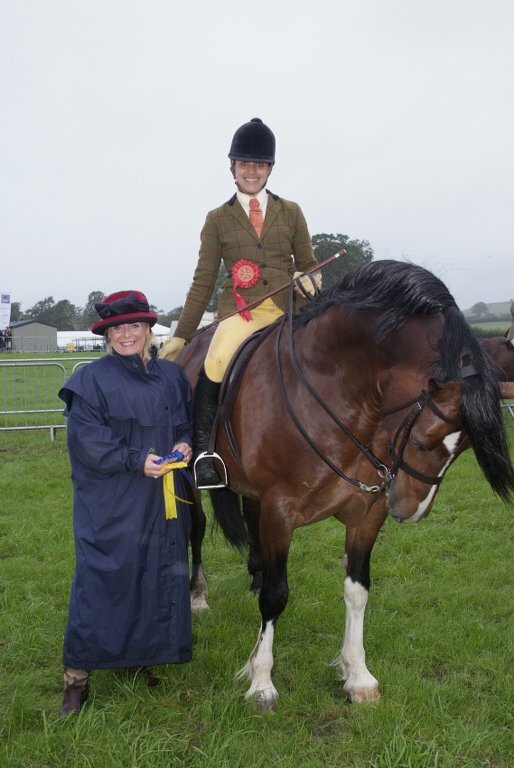 The fell championship went to Scottish rider Zoe Martell=Nicholl riding Hesket Willow while the Shetland Championship was won by The Barugh Family with Birchmoor Viceroy. The well filled veteran classes produced some good wins by Alister Smith from Morecambe with his Welsh Cob Ffoslas Prince of Wales a while Lisa Crabtree took the ridden with Lorenzo 111 ahead of the latter.Joanne Clark from Farleton collected two reserve champions in the working hunter sections riding Border Spice. 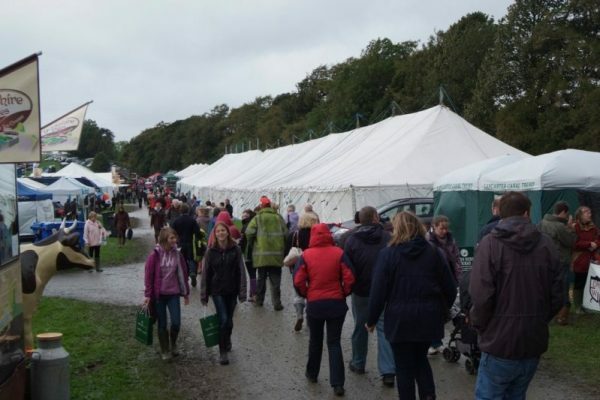 Rain failed to dampen the spirits of show-goers for the 212th Westmorland County Show on Thursday 8 September, when an estimated 25,500 visitors streamed through the gates to take in the sights and sounds of what proved to be another fantastic day. 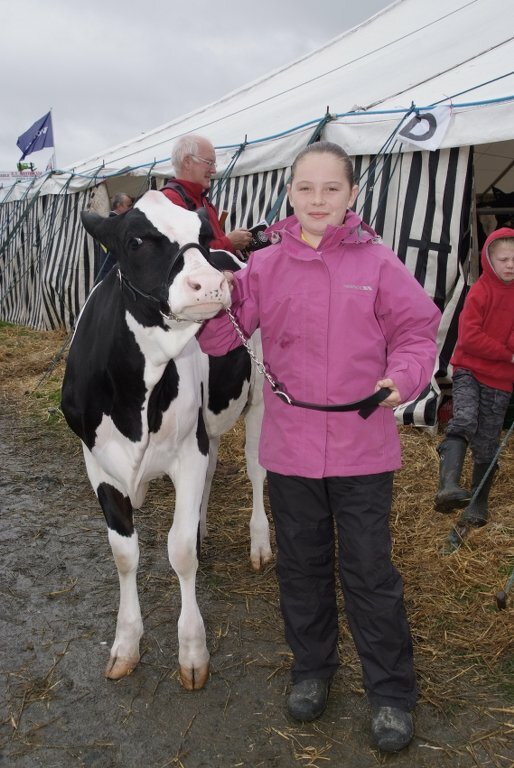 Records were again broken on the livestock lines, which attracted 480 cattle entries, over 100 pigs and an amazing 899 sheep, including the Aberdeen-Angus National show (by the way it rained when they last attended in 2006!) 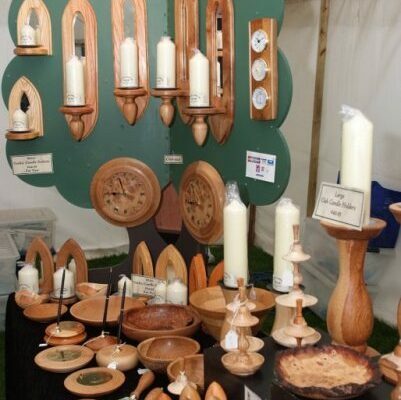 which attracted exhibitors from throughout the UK. 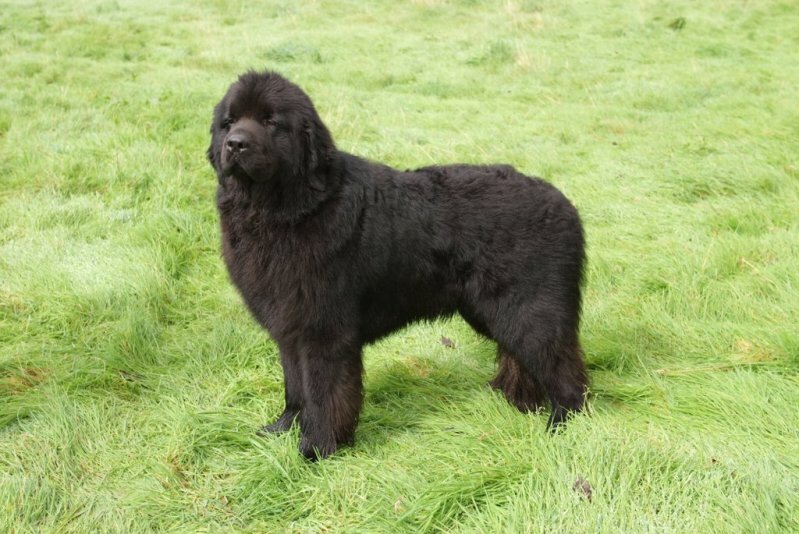 The 103 entries were judged by Victor Wallace of Co Londonderry, who presented the overall title to the two-year old male champion, Rosemead Karona, from P C Stovold and Son, Surrey. 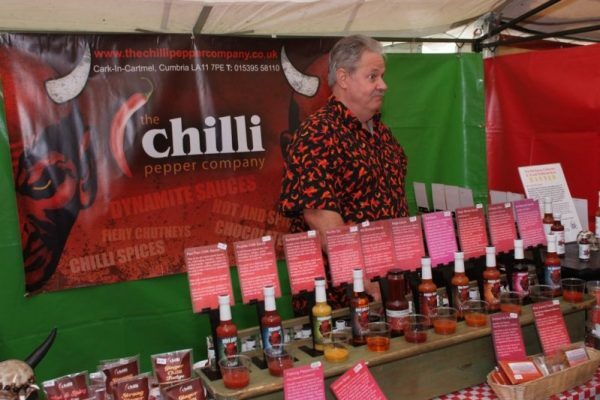 Every inch of trade stand space had been sold out months before the Show, with over 150 applications held on a waiting list. Postman Pat celebrated his 30th Birthday with BBC Radio Cumbria, whilst Woodmad totally wowed the judges with his treehouse and “woody” display, taking first place in the non-agricultural stand competition. 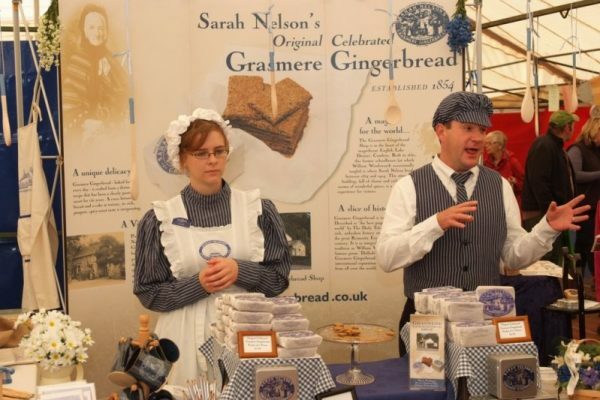 Despite the showers, traders reported excellent levels of business and interest and the new Show Guide, sold alongside the traditional catalogue, was popular particularly with visitors. President John Park, along with his wife Marjorie, really enjoyed his day and praised the tremendous spirit evident throughout the Showground. Not surprisingly, the marquees were full of people all day; magnificent displays were on view in the Learning for Life area, many of them interactive, the WI’s theme of ‘An English Country Garden” inspired over 900 entries from institutes throughout the county and the new “Crafts from Cumbria” marquee showcased craftsmanship from almost 30 different exhibitors. 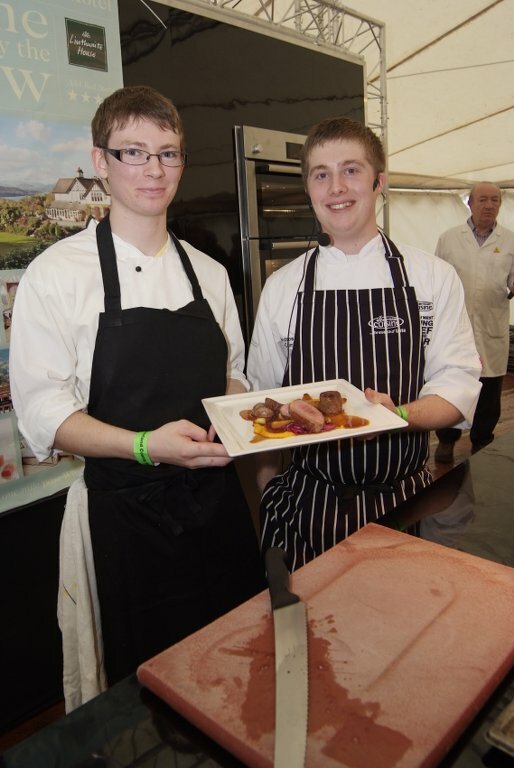 Meanwhile the magnificent Food Hall was a festival in itself, including chef demonstrations which kept people rooted to their seats such as Coronation Street’s Sean Wilson demonstrating what could be done with produce from his Saddleworth Cheese Company and NW’s Young Chef of the Year Andrew Postlethwaite from the Castle Green Hotel. 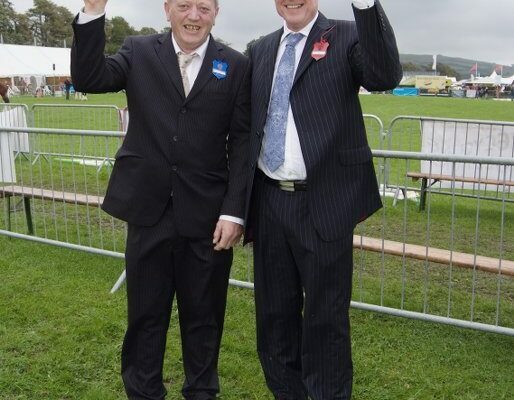 Alongside the ever-popular Sheep Show and sheepdog demonstrations, the Cumberland and Westmorland Wrestling 13-stone World Championship attracted wrestlers from throughout the region, with a packed ringside seeing Richard Fox of Heathersgill win in the 13-stone category, beating Graham Brocklebank in the final bout. 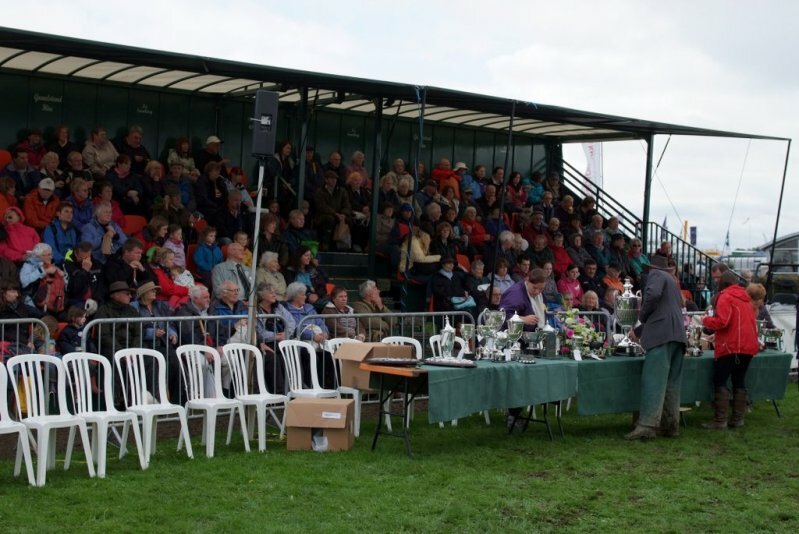 A huge thank you to all the visitors, exhibitors, volunteer stewards and judges who supported the 212th Westmorland County Show – showing the true spirit of Westmorland. ‚ÄúSimply the best‚Äù has been heard many times following this year‚Äôs Show. 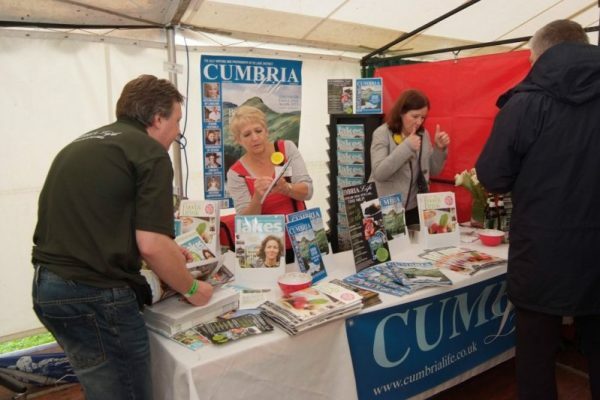 As the sun shone a record breaking 30,800 visitors converged on Crooklands to savour the atmosphere of the 211th Westmorland County Show. 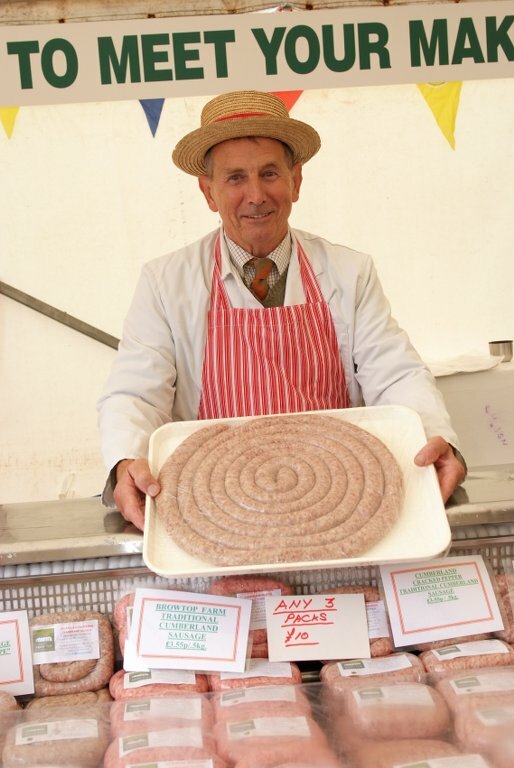 Remaining steadfastly true to its agricultural roots, most sections recorded record entries ‚Äì 442 cattle, 787 sheep, 384 poultry and an incredible 100 pigs. The new breed classes for Hereford and Longhorn in the cattle section and Shetland, Hebridean, Lonk and Derbyshire Gritstone in the sheep were all well supported attracting many new exhibitors. 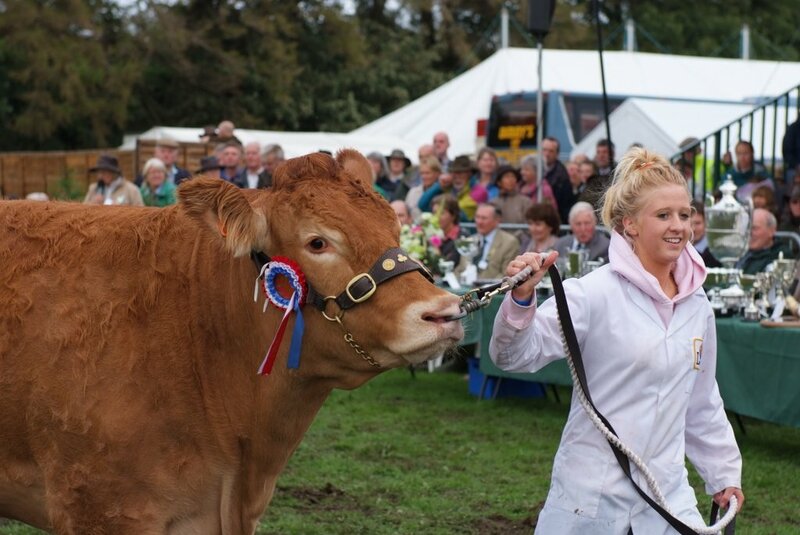 Enjoying their second year in the new location, judging in the cattle section moved to a 9am start and, in a move from tradition, the interbreed championships were independently judged, which proved popular. More judges were also encouraged to give reasons, informing the public what qualities they were looking for when making their decisions. 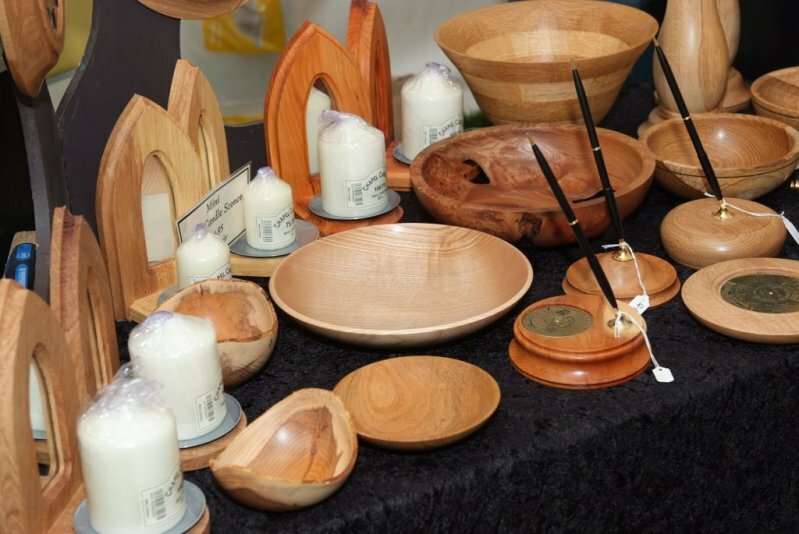 Every inch of trade stand space had been sold out months before the Show, with many applications being held on a waiting list. 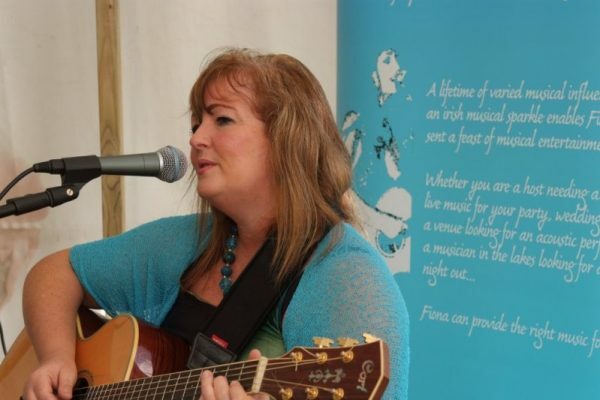 BBC Radio Cumbria made a welcome return with their popular bus and the Brewery Arts Centre wowed visitors with a gipsy caravan. The number of agricultural tradestands again increased, although some regulars could not attend due to dates clashing with the Dairy Event. Sales of advance tickets doubled this year and were available from a wider range of outlets as well as via the new online system on the Society‚Äôs website. 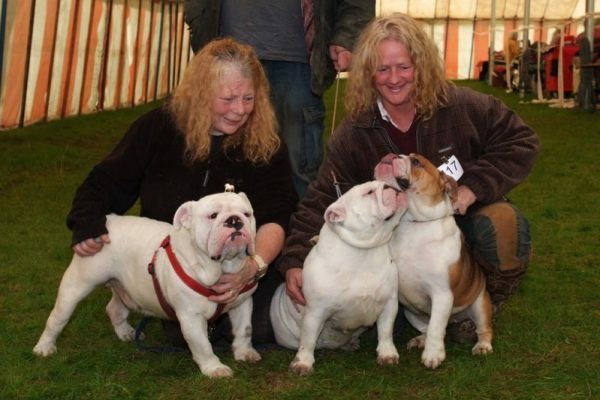 Exhibitors could also enter livestock online, which proved popular and will be enhanced for 2011. 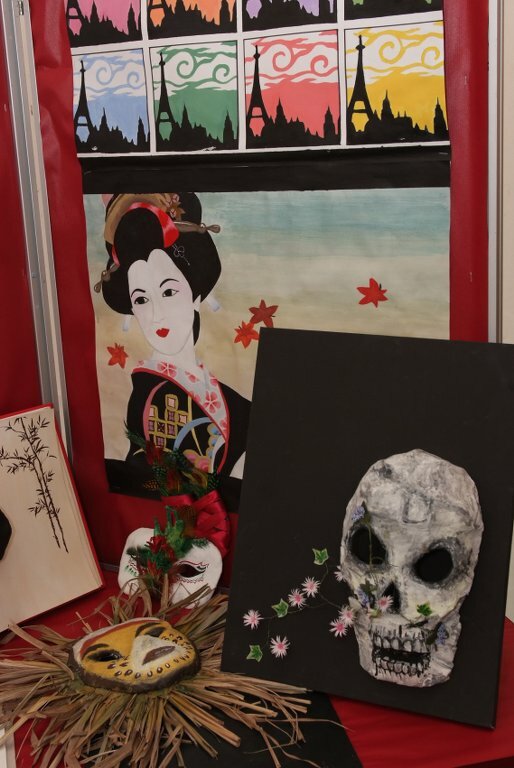 Continuing their 90th anniversary celebrations, entries increased in the Women‚Äôs Institute marquee and magnificent displays were on view throughout the Learning for Life area. 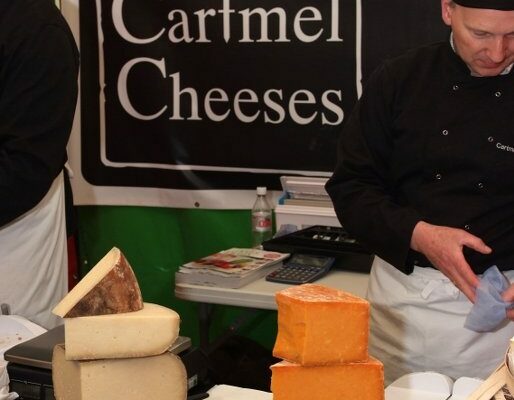 The Food Hall, full to capacity with producers, continued to draw crowds, whilst demonstrators in the Food Theatre, including Sean Wilson of Saddleworth Cheese Company and Peter Gott of Silfield Farm, kept people rooted to their seats. 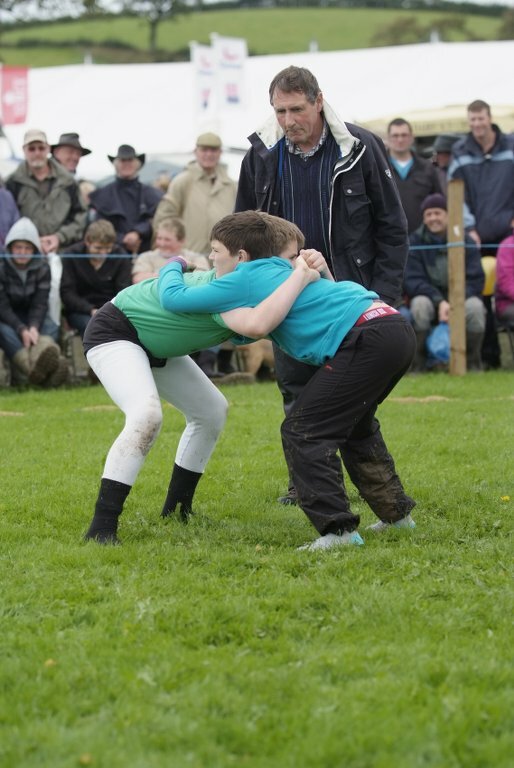 Alongside the now regular Sheep Show and sheepdog demonstrations, South Cumbria Young Farmers entertained visitors with a keenly fought Tug of War competition. President, Jim Dewhurst, along with his wife Audrey, thoroughly enjoyed his day and took time to speak to as many people as possible on his tour of the Showground. All in all, a magnificent day, only made possible thanks to the visitors, exhibitors and volunteer stewards who supported the 211th Westmorland County Show. Thank you. The light horse section under the chairmanship of Carol Hodgson held some excellent classes with the overall supreme championship judged by Joanna MacInnes of the Walton Stud; Penrith and her choice was Alex Robinson from Killington riding the seven year old Greenholme Warbler By Linnel Reynard owned by her uncle Paul Metcalfe bred by Bill Potter from Orton. Alex had a good day with warbler by clinching the overall fell Championship and also won her section in the ridden mountain & moorland. 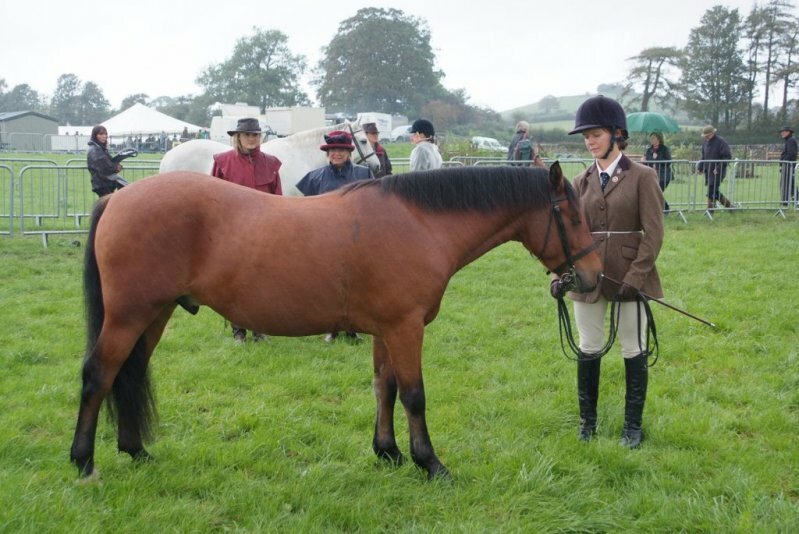 Alex‚Äôs cousin Anna Metcalfe riding her Dartmoor pony Venhay Villia clinched a double in the ridden mountain & moorland and bound for Horse of the Year Show. The reserve supreme went to Sarah Challinor who had travelled from Whitchurch and took the skewbald & piebald champion riding the five year old LWS Dexters Daisy; the section was judged by Rachel Thomas and Matthew Lawrence; the latter who is going to judge in South Africa at the end of October. The open ridden hunters judged by David Goldie and Amanda Atkinson chose Christopher Haigh‚Äôs five year old heavyweight winner Dean Valley Hero with reserve going to Samantha Cloy riding the ten year old Classic Gold II while Penrith‚Äôs Christine Richardson scored a double International qualifier with her 15 year old Lough Crew. 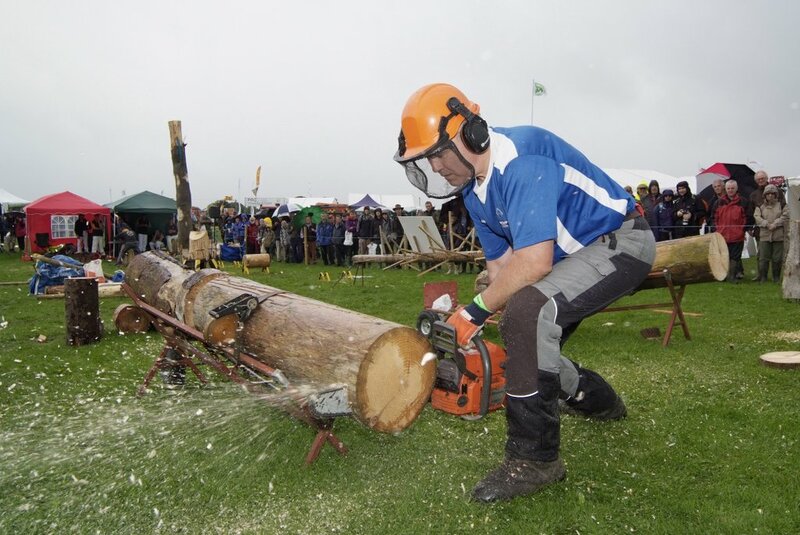 The overall unregistered championship went to Helsington Tailor Made ridden by Alex Peill from Kendal and produced by The Knipe Family from Lambrigg. Alex who has spent the last year studying at The London school of Fashion scored a double win at Bakewell recently taking tickets for HOY. The Knipe family had a good day with Rebecca riding Exotic Dancer qualifying for small hunter while her niece Olivia Taylor riding the four year old Doolittle Taboogle took the mini mountain and moorland section. Millie Manners had a worthwhile journey from Scotland by taking the overall working hunter championship with Dawster Simon of Warleigh ahead of local rider Charlotte Bunting riding Glenmacree. The Jennifer Harrison Memorial Championship went to William Heginbotham riding Meynell Midnight View ahead of Alasdair Prickett riding My Man Dan. Wow, what a day! A record-breaking number of visitors packed on to the Showground for what many have described as the best County Show ever. An estimated 29,200 people basked in glorious sunshine ‚Äì a very welcome bonus given the relentless wet weather over the summer, which had seen many events cancelled. Despite the additional permanent hard roads, ground conditions still necessitated the use of temporary tracking, without which access to car parks and outer areas would have been very difficult. 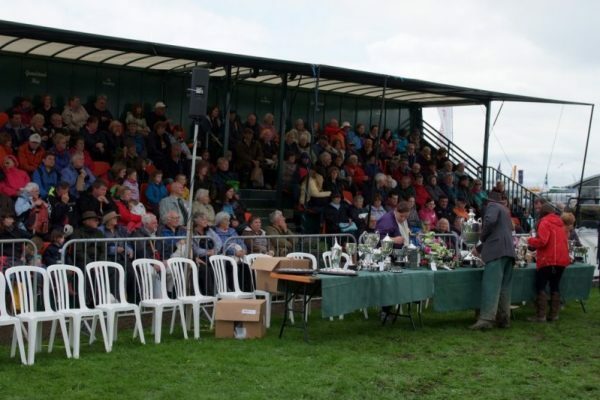 With a number of changes to the Showground layout, the new location for the Cattle section proved extremely successful. The Society has received nothing but praise for the brave decision to re-locate, with much complimentary feedback received from exhibitors, breed societies and visitors. The new cattle wash, generously funded by the Social Committee, had also worked extremely well and not only afforded more room for exhibitors but also allowed the general public greater viewing area to see the cows being washed and milked. 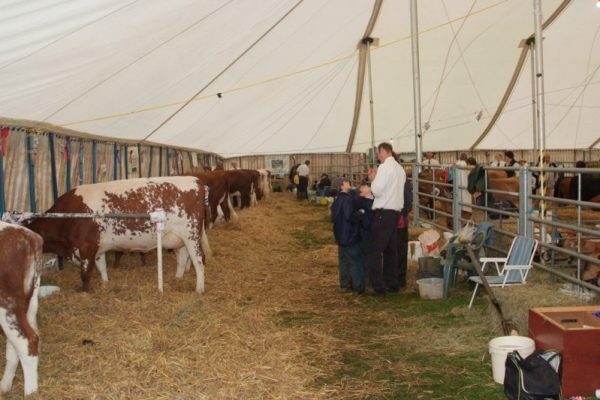 Using the Main Ring for the cattle classes was a popular decision with many, but did cause problems, particularly for the Driving section, with reduced space being available. The Sheep section boasted record entries, where, for the first time, the interbreed judging took place in a dedicated ring, which was packed with visitors. 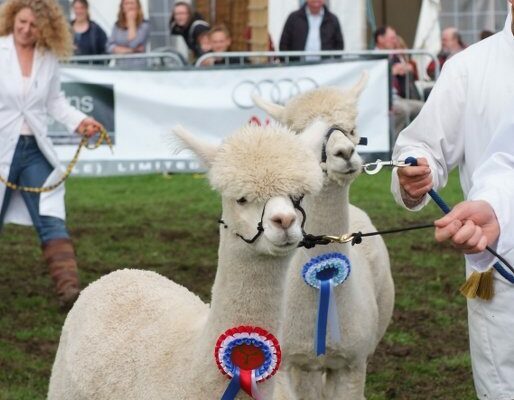 In it‚Äôs second year, the Alpaca section almost doubled, with 110 animals and the Pig section increased to an amazing 76! 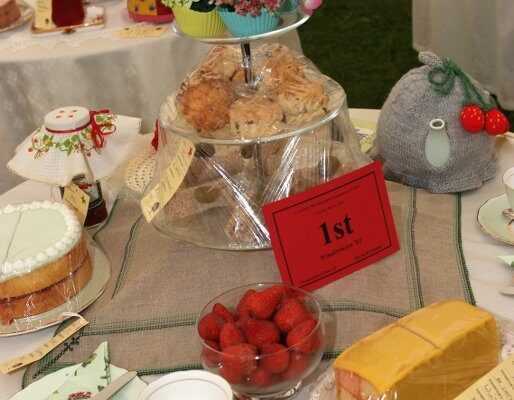 The Light Horse section was very well supported, with excellent entries in all sections ‚Äì so much so that judging continued into the early evening! Show Jumping made a welcome return to the Main Ring and, although the going was rather heavy, the Hadwins Grand Prix provided huge excitement amongst the competitors which included many top names. There was lots going on away from the livestock areas too. The opportunity to bring Countryside Pursuits together with rural crafts, hounds and terriers etc into the old cattle field proved a huge hit with visitors. 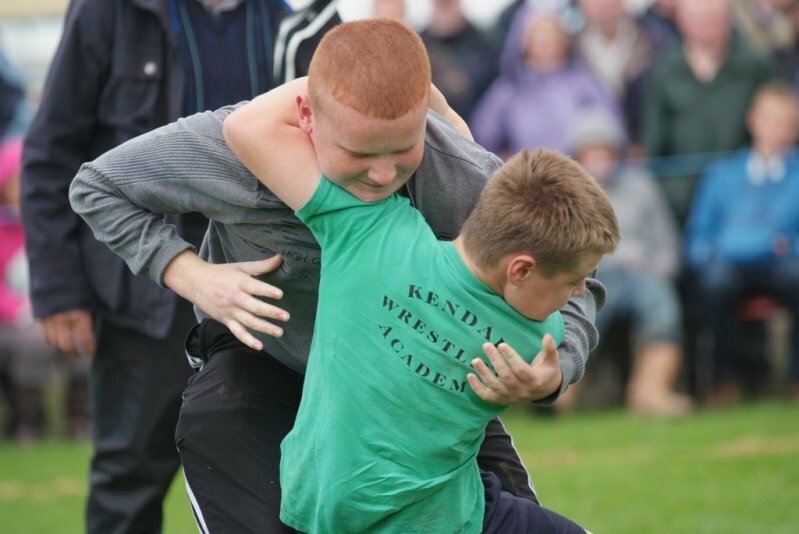 There was keen competition throughout the Cumberland & Westmorland wrestling, which included a World Championship in the under 18 category and attracted large crowds throughout. 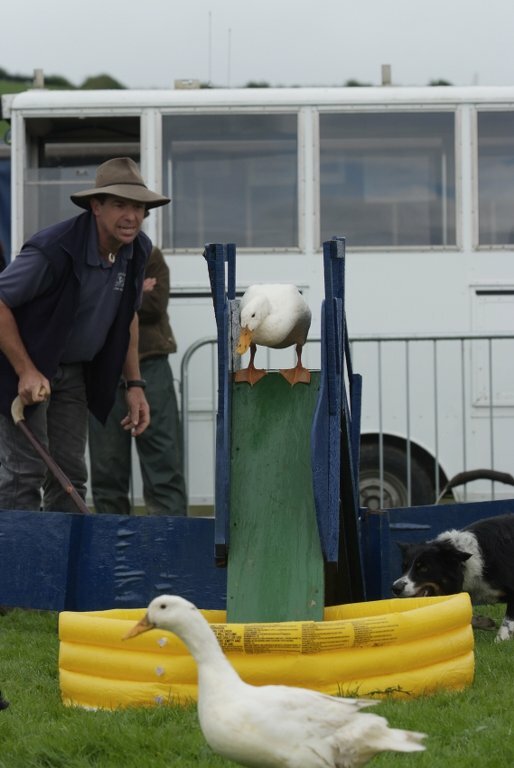 The Sheep Show were well-liked as were Stuart Walton‚Äôs sheepdog and ducks and the Cumbrian Axemen amazed spectators with their axeing skills. 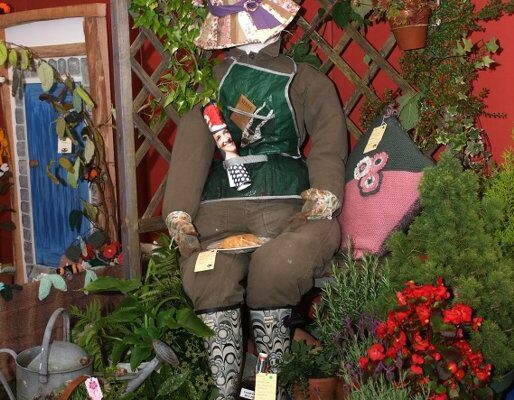 United Utilities put on a fabulous display in the trade area and first time exhibitors, Russell Holiday Homes were awarded top honours for the best non-agricultural stand. 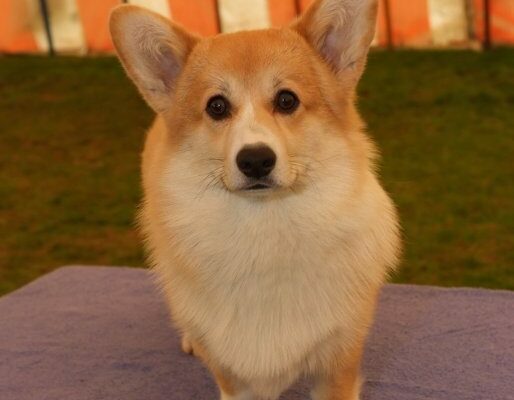 Unfortunately, the new Dog Show area was not popular with everyone and a number of options are being investigated for the future. 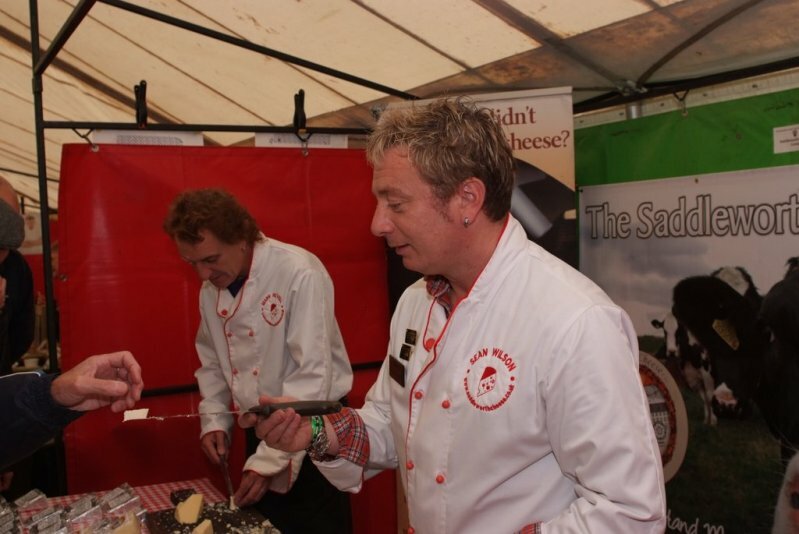 Visitors included Environment Minister, Huw Irranca-Davies who was bowled over by the quality and diversity of products in the Food Hall and urged more of the county‚Äôs traditional food producers to apply for protected status. 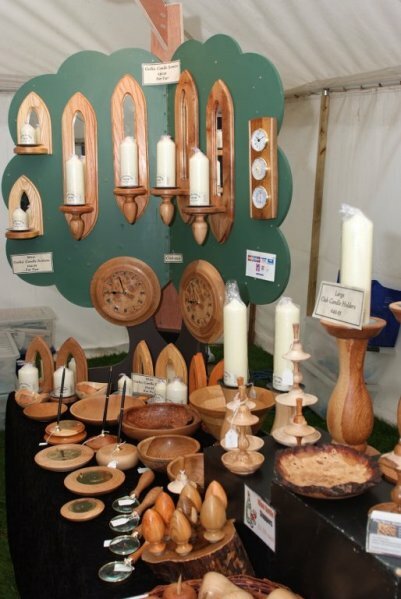 The Minister also officially launched the Cumbrian Woodland and Forestry Festival, which aims to promote the wide array of businesses involved with wood and associated products. Meanwhile, Meurig Raymond, Deputy NFU President, was extremely impressed with the superb quality of the livestock exhibits. 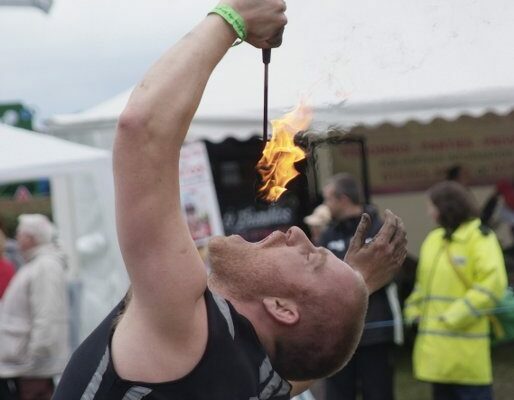 Increased media interest included Border & BBC TV, local & national radio, and the event will also feature in an ITV series to be screened early next year. 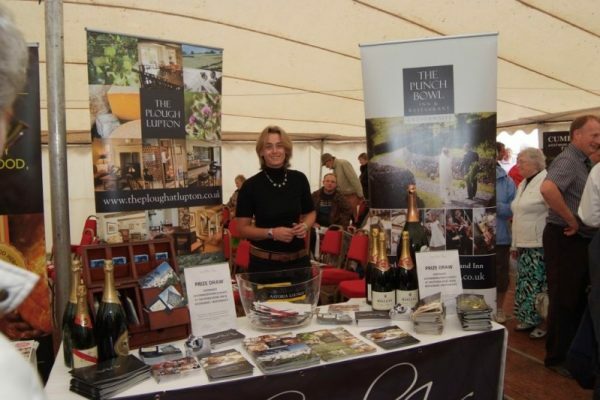 President, Dorrie Galbraith, along with husband Robin, enjoyed a fantastic day and one she thoroughly deserved. A rapturous welcome greeted the presidential party in the WI marquee, with members putting together their own special tribute to Dorrie. A downside to the Show‚Äôs popularity saw the road network grind to almost standstill, as massive tailbacks built up around Crooklands (we even made national radio) ‚Äì an issue already being worked on for next year. It takes more than a drop of rain to stop Westmorland! 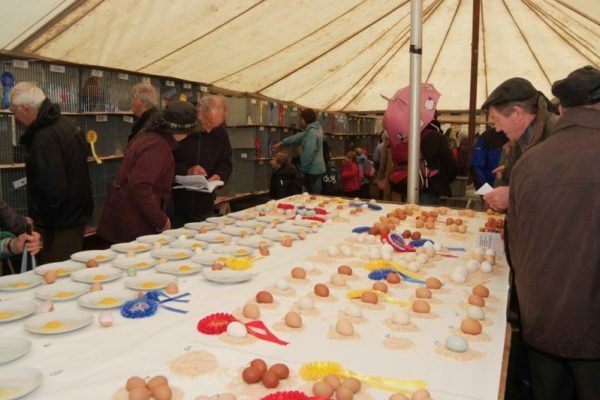 Tremendous team spirit and a “never-say-die” attitude helped pave the way for what can only be described as a fantastic 2009 Westmorland County Show. The Show season began with uncertainties over livestock classes due to bluetongue restrictions and continued with the wettest summer on record, resulting in many events being cancelled. Without the tireless efforts of so many, that could also have been the case for the County Show. But, thanks to additional infrastructure investment, including almost two miles of temporary metal tracking, the Show went on, attracting an all-time record crowd of 25,500 who flocked to Crooklands to witness a true agricultural show with all the trimmings. Even the sun shone! 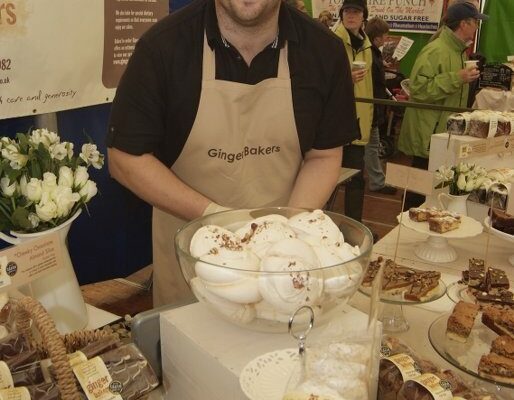 Seeing all the smiling faces throughout the Showground made all the extra hard work worthwhile. Following the disappointment of 2007, it was great to see the return of livestock. 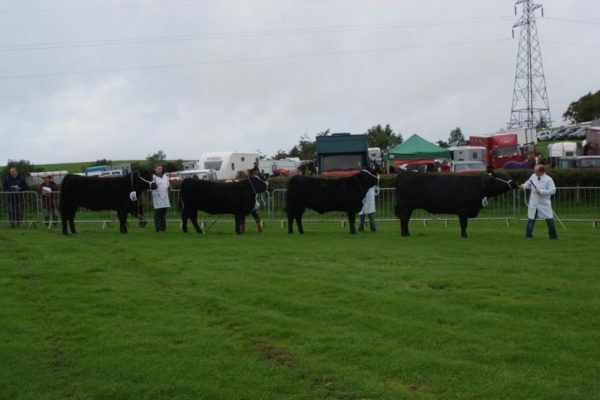 The Cattle section boasted record entries of 440, including the new Young Handler classes, Longhorn cattle, exhibited by Kirkham Prison, making a welcome return and the new Red Poll and Highland sections were very well supported, drawing excellent crowds. 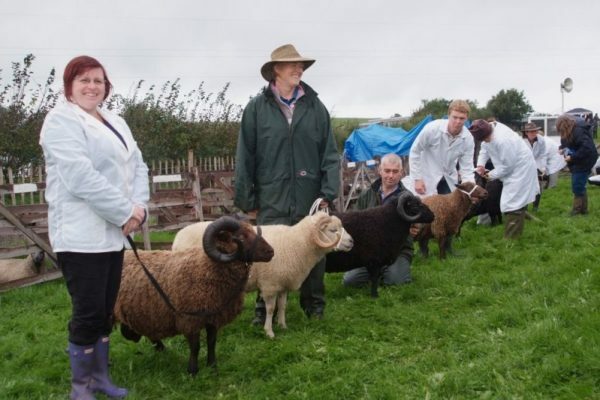 In spite of attracting entries from far afield, local exhibitors triumphed in the sheep section with both sheep championships being awarded to long standing exhibitors: overall lowland to the Geldard family of Foulshaw and the upland to Brian and Jayne Knowles of Selside. 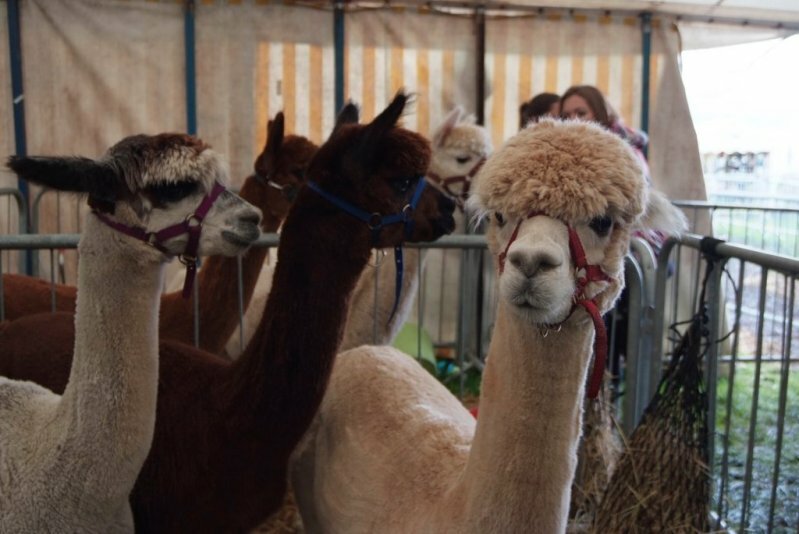 A new competitive Alpaca section and the country’s first short-fleece halter show, attracted an amazing 64 entries, which proved very popular with visitors. 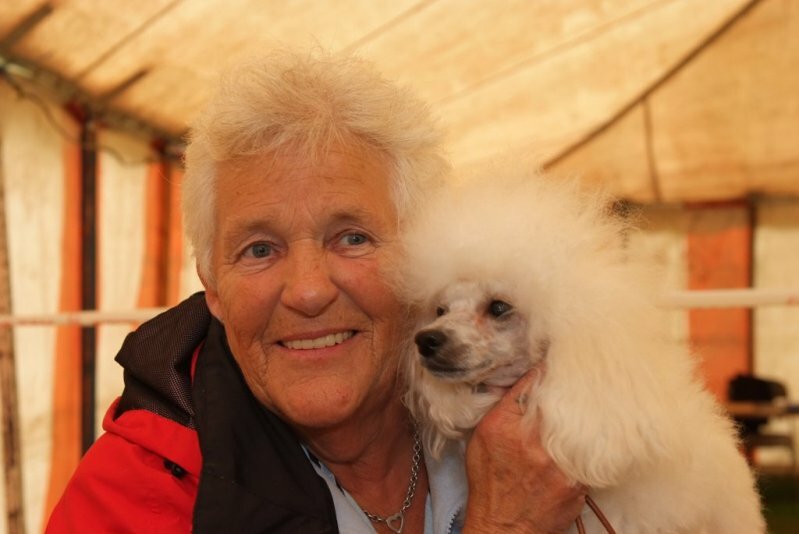 Although every horse box had to be pulled onto the field, entries were nevertheless very strong throughout the Light Horse section, which included Veteran classes for the first time. Unfortunately Show Jumping fell victim to the soft ground, but there was still plenty of activity in the Exhibition ring, including magnificent heavy horses, private driving and displays from Stuart Walton’s sheepdogs and falconer Terry Large. The Grand Parade made a wonderful return, complete with champion pig and alpacas! 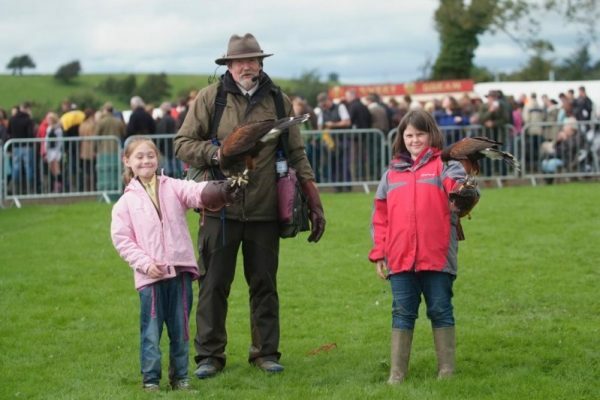 Aside from all the animal magic there were lots to see throughout the Showground, which certainly provided something for all the family. 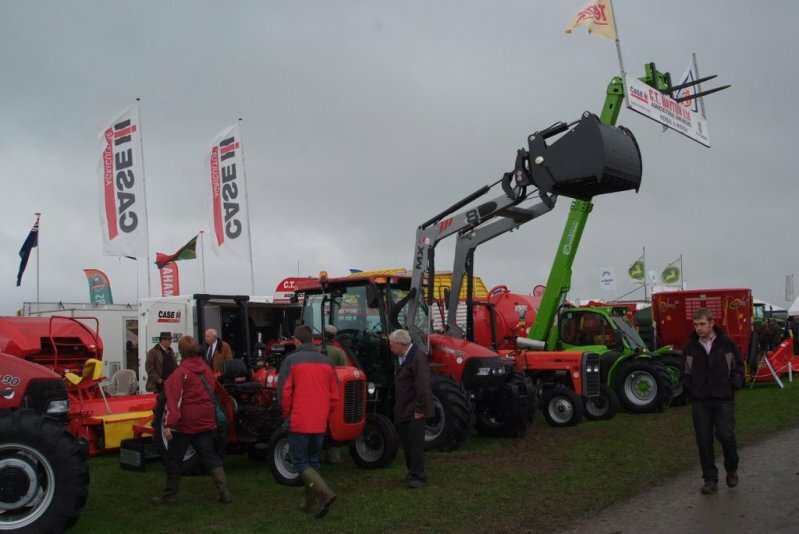 The wide array of trade stands included first time exhibitors Kendal Judo Club, who took first prize for the best non-agricultural trade stand which included childrens’ demonstrations throughout the day and Jardine’s enormous crane could be seen from all around. The Sheep Show proved a hit with the crowds as did the Cumbrian Axemen and keen competition in the Cumberland and Westmorland wrestling section resulted in matches being judged on one fall only. 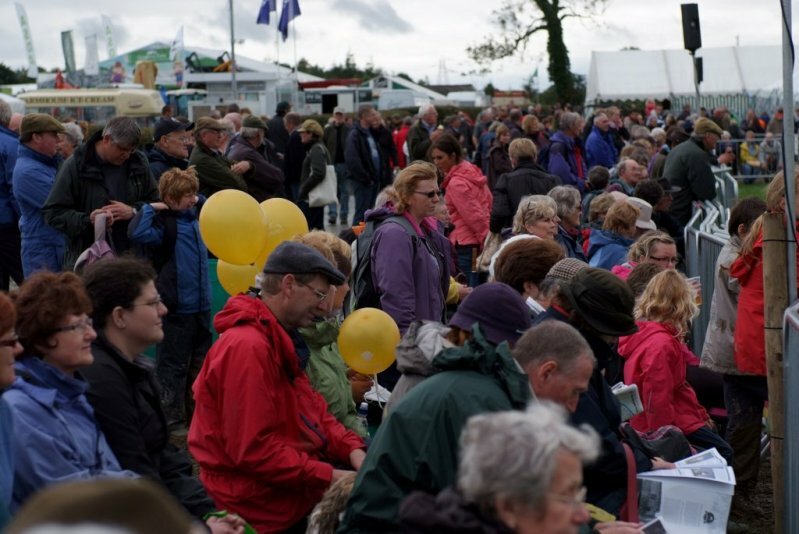 A downside to the Show’s popularity saw the free bus service totally oversubscribed, despite extra buses being added – an area already set to be addressed for next year. Henry Worsley, Deputy President of the CLA, was amongst the visitors to the Show and was very impressed with what he saw, particularly praising the content and quality exhibited in the Food Hall. 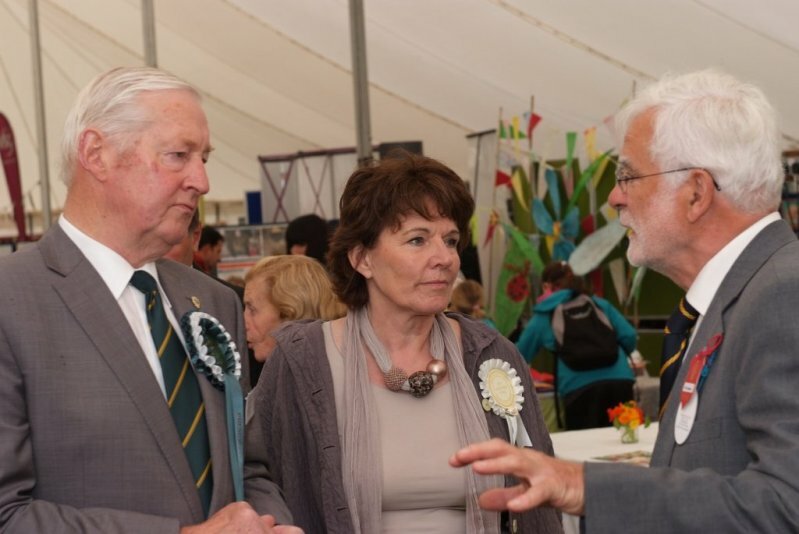 President Bill Philip, along with his wife Margaret, thoroughly enjoyed his day and took time to speak to as many people as possible on his tour of the Showground. For the first time Border TV broadcast throughout the day and highlights can still be viewed on the Country Channel. All in all an amazing day, but let’s hope that wet summers are not here to stay! 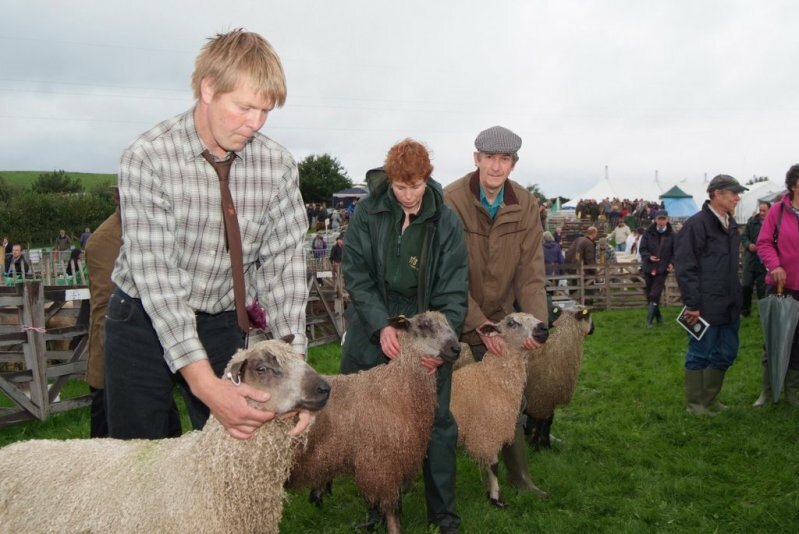 The 208th Westmorland County Show will be remembered as a unique event ‚Äì the only one in history not to include livestock classes. Despite the devastating news of the previous afternoon, crowds nevertheless flocked to the Showground demonstrating a huge wave of support, not only for the event itself, but also for the wider farming community. An almost record crowd of 25,100 enjoyed the day and it was great to see so many ‚Äúwould-have-been‚Äù exhibitors took the time to come along even if their animals couldn‚Äôt. 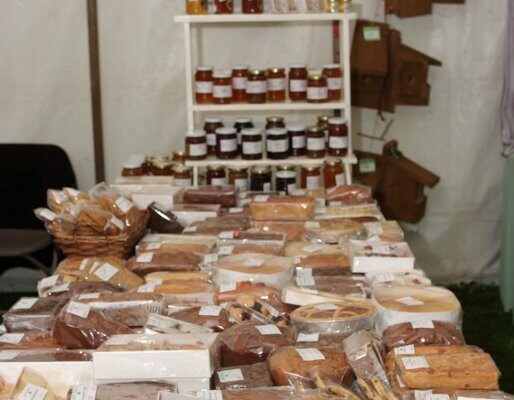 With over 350 trade stands, record entries in the equine sections along with dog, hound, terrier, stick and poultry classes, there was still something to satisfy all ages and tastes. 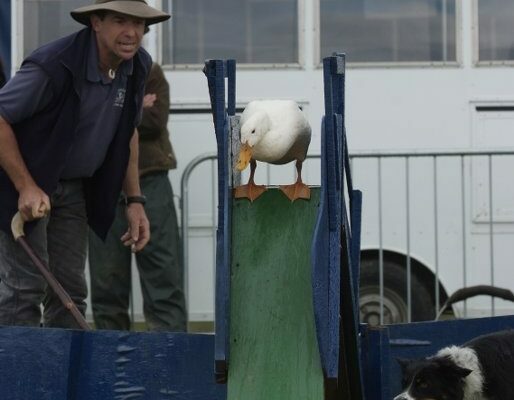 Huge thanks go to the many people who stepped in to provide alternative displays ‚Äì Stuart Walton with his Ducks and Dogs, the Philip family for the virtual Highland Cattle Show, Greenside Alpacas for the miniature donkeys and Graham Wadsworth for the petting farm area. 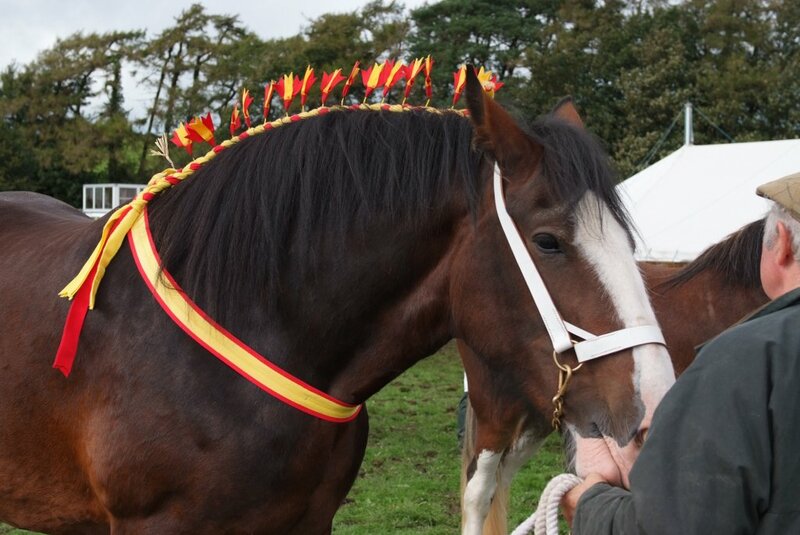 Classes for Open Heavy Horse were held for the first time and, alongside the traditional Shires, attracted over 60 entries. A special ridden heavy horse class provided added excitement in the exhibition ring. The driving section also boasted record entries, with keen competition, especially in the cone driving class. 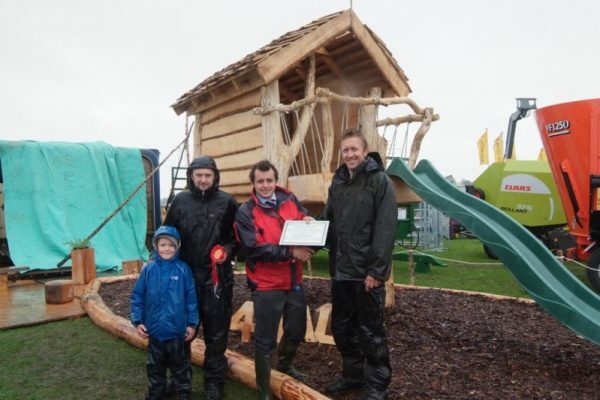 Jonathan Shaw MP, Minister for Marine, Landscape and Rural Affairs, was amongst the 25,000 visitors to the Show. Spending time talking to local farmers gave the Minister opportunity to find out exactly what the movement restrictions would mean for Cumbrian livestock producers. He also presented prizes to the winning Food Hall exhibitors. Light Horse followers were treated to an exhibition and demonstration class by the Icelandic Horse Society and Young Farmers entertained visitors with a car-rolling challenge ‚Äì much to the delight of onlookers, a six strong team rolled a Vauxhall Astra, which had been painted to look like a cow, 200 metres across the main arena against the clock. President Chuck Mason, along with his wife Averil, thoroughly enjoyed his day, visiting parts of the Show he had not seen before. Never let it be said that Westmorland didn‚Äôt have cattle in the Grand Parade ‚Äì instead of the traditional parade of prize winning animals, life-sized fiberglass cows were driven around the ring ‚Äì to huge cheers of support from the crowds. 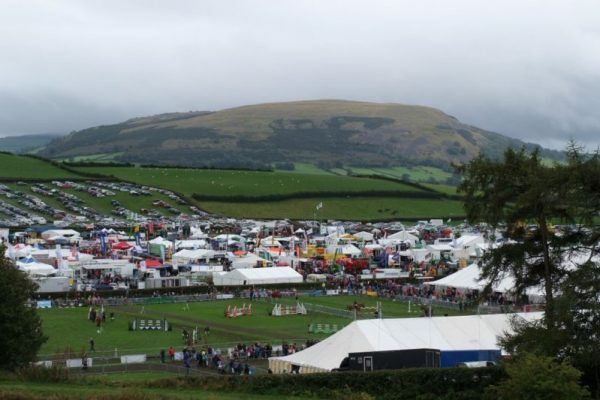 It is hoped the 207th Westmorland County Show is not just remembered for the weather; rain aside, it was a fantastic day of which the Society should be proud. Over 20,000 people braved the weather and happy faces could be seen all around. Most sections recorded record entries ‚Äì 720 sheep, 410 cattle, 550 horses and an incredible 75 pigs ‚Äì an increase of over 300 animals from 2005. 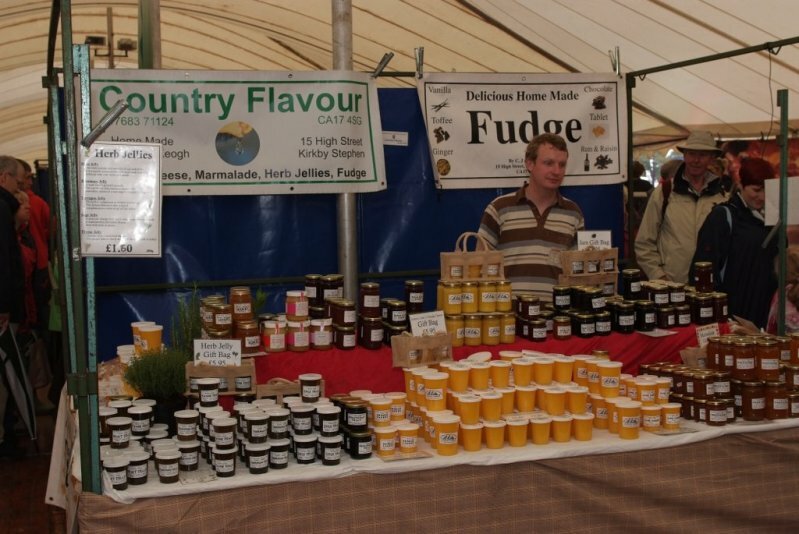 Exhibitors arrived from all parts of the UK ‚Äì sheep from the Orkneys, driving horses from Norfolk, cattle from Devon and Aberdeen, along with hundreds more closer to home. 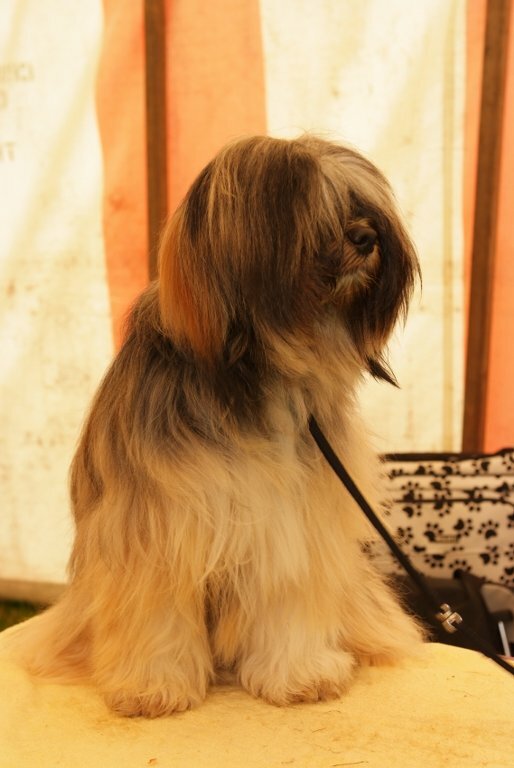 The two returning National Championships were again a huge success, attracting stock of an extremely high standard. Our New Zealand judge was most impressed with the pig section which boasted individual breed classes for the first time. Lord Jeff Rooker, Minister for Food and Sustainable Farming was amongst the many guests (by the way it rained when he last visited in 1998!). 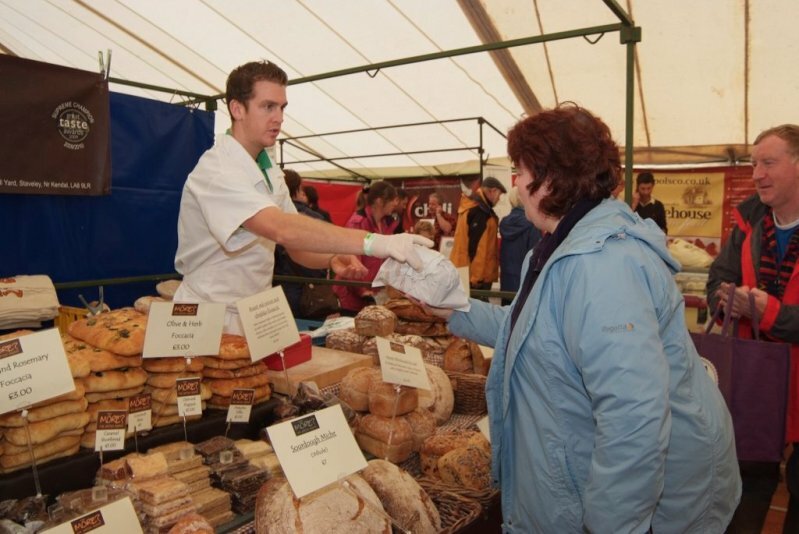 He enjoyed the opportunity of talking to local farmers in the NFU tent and also presented prizes to the YFC cookery competition winners. President Len Hayton, along with his wife Joy, really enjoyed his day and praised the tremendous spirit evident around the field. 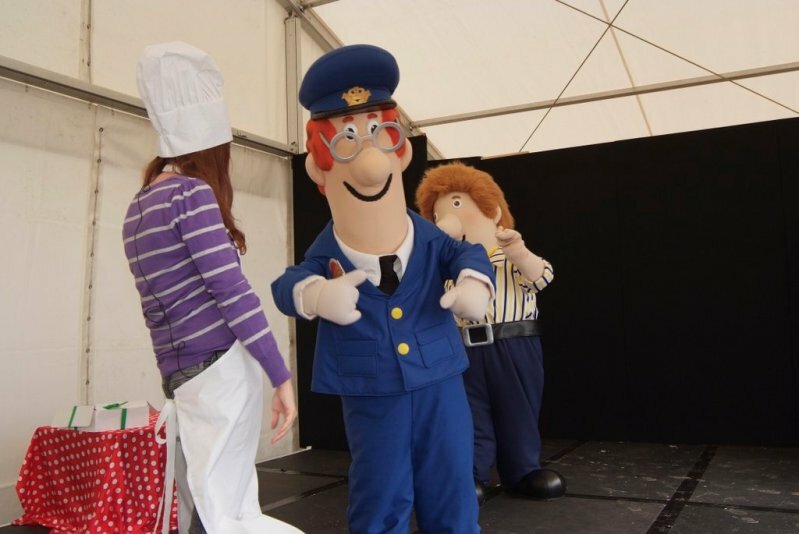 Unfortunately the Grand Parade, usually a Show highlight, was rather short, but Joy managed to lift the occasion by still gracefully wearing her lovely hat! Not surprisingly, the marquees were full of people all day: over 50 schools and educational organisations displayed superb exhibits in the Learning for Life marquee and the WI‚Äôs theme of ‚ÄúAll Things Bright and Beautiful‚Äù provided a colourful spectacle. Producers did a roaring trade in the Food Hall and there were queues aplenty at the Local Food Court. New for 2006 was a display of vintage agricultural machinery. Many visitors encountered difficulties on the roads, particularly when departing from the car parks. This problem, along with other vehicle-related issues, is being thoroughly reviewed ‚Äì with the intention of keeping traffic flowing. From this year‚Äôs survey, 98% of visitors said they would be back ‚Äì rain or no rain!